As far as reentry* points to on-a-whim cooking go, these cookies aren’t the most obvious choice. I might have gone with something from the market, or something from a new fall cookbook or maybe just something practical that would feed us for the next few days, like a hearty stew. Instead I went with cute. Like, unseemly cute. Borderline twee. I might as well tie a ribbon around them, had I any ribbon or the ability to tie it without yelling at it (it’s true; I’m ribbon inept), no doubt eradicating any sweetness in the gesture. I don’t know what came over me. One day I was craving apple pie because that’s what you do in October, you crave apple pie, the kind that you pull from the oven still gurgling under its vented lid, a trickle of juices making their way for the crimped edge, the kitchen smelling like fall blew up in it. But I wanted my very own pie, a pie I didn’t have to share and so the obvious place to have gone with this would have been with hand pies. But I’m finishing up the cookbook’s dessert section right now and lordy, I hardly need more butter-and-sugar laden confections lying around but, short of denying oneself pie (madness!) I wondered exactly how tiny I could make them and from there my brain latched onto the idea of cookie pies (or “tookie” pies, as my sidekick would call them). Teeny tiny adorable cookie pies. I may have finally lost it. Let me make this clear before we go any further that this is pie for crust lovers as the crust-to-filling ratio is off the charts. It’s also for people who don’t like their desserts overly sweet; pie dough is mostly unsweetened (although I bumped it up, only a bit) and the apples are just dusted with cinnamon spice sugar. And there’s only the tiniest slip of apple. But the taste is unmistakeably apple pie, especially when it’s still warm. Oh, and you’re seriously not going to believe the crust — unhampered by a heavy, wet fruit filling, it’s a mille-feuille of a cookie, expanding like a tissue paper globe in the oven. And to be honest, by the time I put the first mini-batch in the oven, I had already talked myself out of sharing it with you. “Too much work!” “Overly precious!” I muttered, always the critic. But then I tried it — this token of an apple pie — and knew immediately that fall would have been slightly less awesome this year without it. * I’ve missed you terribly. I’m thisclose to finishing my manuscript and it has been consuming every minute of my time. Or it was until I decided to go all Tiny Apple Pie or Bust. I think it was a good choice. Let’s do this more often. Promise me that you won’t mess around with soft pie dough, here or anywhere. The single easiest way to master pie crusts is to decide at the outset that you won’t waste your energy on limp, stretchy dough. As soon as your dough softens, transfer whatever you’re doing to the freezer for two minutes to chill it again. Soft dough is hard to work with. It’s stretchy and doesn’t cut clean shapes, it gets sticky and you compensate by over-flouring it and that stickiness is those tiny bits of butter that will be your layers of flakes later disappearing, melting before they hit the oven and sealing into zillions of buttery pockets. It will also annoy you and make you think that you’re bad at working with pie dough but you’re not. You’re just warm-blooded and you need to put the pie dough back to chill for two minutes. Two round cookie cutters of different sizes. I used 2 1/2-inch and 1 1/2 to 1 3/4-inch rounds. You’ll want to make sure there’s at least a 3/4-inch different in the sizes, as you’ll need the extra margin to crimp your dough. Meanwhile, get everything else together: Line up six small dishes. In the first one, pour some water. Leave the second one empty; you’ll use it for your apples in a bit. 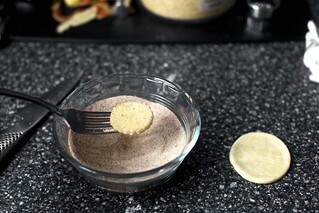 In the third one, mix the sugar, cinnamon, nutmeg and any other spices you like in your pie, such as a pinch of cloves. 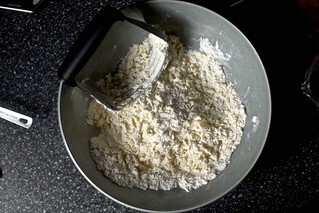 In the fourth one, place a little bit of flour to dust your surface and dip your fork for crimping. In the fifth one, whisk an egg with one teaspoon of water until smooth. In the last one, or in whatever container you keep it in, add some coarse or regular sugar for decorating the tops of the pies. You are very likely thinking I’ve lost my mind by now and you may not be terribly far off. Prepare your apples: Peel your apples. 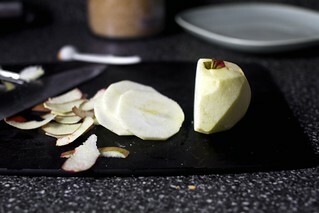 Cut thin (1/8-inch thick) slices from one side of whole apple, stopping when you hit the core. Repeat on opposite side. I got about 10 usable slices from each side of my small-medium-ish apples. Use the smaller of your two cookie cutters (mine was about 1 2/3 inches) to cut the apples into cute little discs that will fit inside your pie cookies. Place them in your second bowl, covering them with a few drops of lemon juice if you find that they’re browning quickly. And now, assemble away! Grab your first disc of chilled dough and lightly dampen it on one side with the water. This is to help it seal. Take your first disc of apple and toss it in the cinnamon spice sugar. Place it on the damp side of the bottom disk. Place a second disc of dough on top; I found it easiest to seal it by picking the whole thing up (this is when you’ll be glad that your dough is cold and semi-firm; if it’s soft and getting sticky, chill it until it’s easy to pick up) and press the tops and bottoms around the apple with your fingers. Back on the floured counter, cut decorative slits in your “pies”. 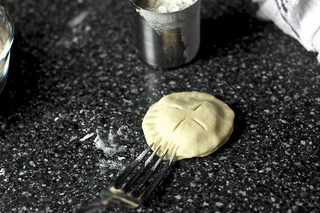 Dip your fork in the flour and use it to create a decorative crimp on the sealed edges. Brush your cookie with egg wash and sprinkle with coarse sugar. Replace on baking sheet and chill while you prepare the others. About now, you’ll curse your friendly food blogger for getting you into such an exacting cookie making process but I promise, the first couple are slow and the rest come together very quickly. 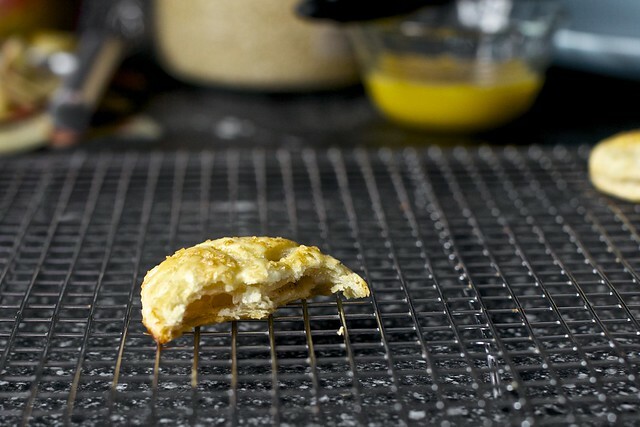 Bake your apple pie cookies for 25 minutes, or until puffed and bronzed and very pie-like. (If this is your first batch, peer in at them at 20 minutes, to make sure your oven doesn’t run hot.) Transfer to a cooling rack to cool before eating them… oh haha. I forgot who I was talking to. Do ahead: These will keep for a few days at room temperature, though not in my apartment. You could also make a larger batch of these, doing everything but brushing them with egg and sprinkling them with sugar, and keep them frozen until needed. Bake them directly from the freezer, just adding a couple minutes to the baking time. Those look so cute! I love apple pie, but I definitely prefer a high crust to filling ratio, so these look perfect for me! I can’t wait to give them a try! Oh wow, these look like little awesome bites of heaven! You left a great tip in this post about the dough softening and transferring it to the freezer. Thanks =) I must try that! These look so beautiful! I will have to try these out tonight- perfect for the crisp, fall weather! I cannot get over how adorable these are! I would love to make them for thanksgiving! I LOVE these; apples have been my fruit of choice over the past few weeks!!! I’d like to think it’s better to eat just one of these little guys than having a whole apple pie sitting on the counter taunting me — however I’m thinking that I’d have to give some away to the neighbour otherwise one would probably turn into ten! Oh…my…god. I have never heard of these, yet it is readily apparent that I have been waiting my whole life for these. Will make, asap. do you have any tips for a gluten free version? Naomi — I’ve never made it before so cannot attest to how well it works, but I’d start with Gluten Free Girl’s pie dough and keep everything else the same. Seriously? I think you’ve outdone yourself. I love these! I’ve been making little pies on a stick – because things on a stick are always more fun, right? – good luck wrestling that manuscript – I can’t wait to see your book! WHAT HAVE YOU DONE TO ME. Pie crust scares me and yet I find myself COMPELLED to make these. I’m betting even if they don’t turn out looking pretty, they’ll still taste heavenly. What’s your theory on filling them with other things (like preserves or mincemeat) and serving warm, for upcoming holiday shenanigans? yes, yes and yes! Never thought of making cookies with more of a pie dough feel, but that is about to change! this are so adorable!! i don’t bake EVER but i’m going to attempt these cause i LOVE apple pie. I kind of want to pet these babies and give them a paci. Sophie — So freaking cute, those! Great photos, too. Oh, so cute! Please don’t deny sharing with us just because you’re worried about cuteness–we love it. Where do you get these ideas! How creative! They look so cute and delicious! So excited you posted! I’ve missed you. I have some time off work in the next few weeks, and I can’t wait catching up on some of your recipes. A new smitten kitchen recipe is the highlight of my week! I live alone, so sometimes a whole pie isn’t practical, but I could easily make these cookies and freeze some for later. Or eat them all up in four days..Who am I kidding? “This is pie for crust lovers” – there are people who don’t love crust??? These are adorable. I am going to make them and hold them and pretend I am a giant. These are so adorable! I better make these for my friends and coworkers. It’s the kind of dessert that people never stop talking about! These look so super that I can hardly contain myself. I’m going to be wearing my special apron tonight prancing around the kitchen! SUPER! Oh yes, and while apple pie may be a creative flavor for many things (your brilliant cookies, cupcakes, smoothies, etc. ), never – and I repeat, NEVER – attempt apple pie chicken. It does NOT work. So cute I could just….eat them. All. Everyday. I don’t feel the least bit compelled to make these — yes, too much work, too high a crust-to-filling ratio. But I feel completely compelled to tell you that we’ve missed you, too (I speak for us all) even though we also can’t wait for the cookbook. You are RIDICULOUS! I can’t believe you did this! To be clear, I want to eat them. I just don’t want to make them. You just inspired me to make these for a friend’s Halloween Party. I think I will use a ghost, pumpkin or spider cookie cutter to add some holiday flare. The best part of these are that the possibilities are endless! I know my friend would love a cherry filled one for a birthday treat. Great idea! Oh, Deb, these are just the prettiest cookies. I’m always looking for apple recipes in the fall because I love to go apple picking – numerous times – thus creating a surplus of apples at my place. These are so adorable. I’m in love! These are absolutely adorable!! Would also be fun with mixed berries for summer!! MMMM… pie crust….. I can’t decide if this would be more work or less work, but you might be able to increase your yield of slices/apple by slicing it latitudinally on a mandoline. You’d then have to cut out the core with a tiny 3/4″ cookie cutter, but that’s actually not too bad (I did that this weekend to dehydrate apple slices). Heck, you could then do apple pie ring cookies – or you could cut plugs from any leftover slices to fill the holes in the center of your slices. Wow, those are cute. I don’t like fruit deserts or pie, but make ’em into darling a cookie and now I want to try it. These are adorable. I love how they really do look like little pies. These are so stinkin’ cute. I’ve missed you and glad you are back! You mention adding ice water in the directions, but not how much in the ingredients – how much ice water should I add to the butter/flour mixture?? Thanks! Daniella — Whoops, fixed now. I hadn’t meant to be away so long. I blinked and two weeks passed. It won’t happen again. Ooo Those look amazing… think of a scoop of vanilla Ice cream, drizzled with carmel sauce, and one ( or maybe 2) of these Yummy apple pie cookies wedged in there just right! If you need to impress your mother-in-law that would do it! This is so cute it would almost be hard to eat them. Except it wouldn’t. Because they are undoubtedly delicious. Oh my goodness, first of all, CHECK IN when you are going to be gone this long. I literally Googled you this week, worried I would find out some horrific misfortune had befallen you! Second of all, I NEED to make this very, very soon. Thanks for the (not at all ridiculously) cute idea! It was a brilliant choice! We have totally missed you too!!! I’ve been scouring other food blogs to fill the void, to no avail, because none are as good as you as far as I’m concerned. Can’t wait for your book!!! Cute! I’m too scared of pie dough though. peggy, use a food processor, use very cold butter (even frozen butter cut up into small chunks with a very sharp knife), don’t add too much water (the dough should JUST come together), and try not to handle the dough too much. oh and put it back in the freezer as soon as it starts to feel sticky, like she said. those are the only pie dough tips you need…and it’s the easiest thing ever. i hope you try it. i used to be afraid too. 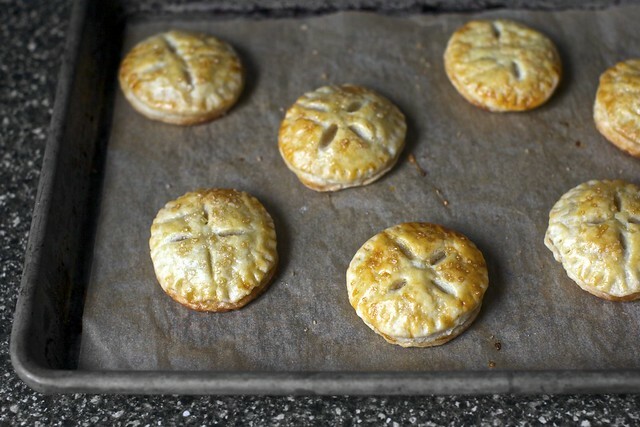 i’ve actually never made a big pie…just little ones like these and empanadas/hand pies. i have another great dough recipe. i’ll have to see if this one has similar proportions. Awww they look so cute! I’m a total crust lover. I think I’ve got some frozen pie dough somewhere… time to dig them out and give them a try! CANNOT wait to try these!!! I know you say the smaller cookie cutter you used was about 1 2/3 inches. How about the larger? 2 inches? I know I don’t need to use exactly the same size, but just want to get some idea of the ratio between the size of the pie crust rounds and the apple slices inside. Thanks!!! TrishR — Whoops, I accidentally cut out an entire few sentences about the other equipment you’ll want on hand (pastry brush, etc.). My big cutter was 2.5 inches. I just added the list of “equipment” back to the recipe so what you’re looking for will hopefully be better explained. Thanks. I absolutely know what you mean by wanting a kitchen that smells like fall blew up in it. If only we could market a candle under that title. =) I am a sucker for all apple desserts, and this looks like a winner. Plus, maybe it would help with portion control? Probably not. I am beyond excited about these! I think you’ve invented the perfect solution to my apple pie problem – my husband loves apple pie, but I think it’s boring and I never bake it (unless I lose a bet – my husband always bets an apple pie). This I must try! This is something I can get behind! This will be the perfect excuse for not vacuuming or finishing thank you notes today – I mean – my husband will be so excited! These are awesome. Though frankly I am concerned that you have to feel you must share pie with others. I heartily support consuming entire pies without sharing. Tell those fools to make their own pies. These look fantastic, I was actually just pondering trying to invent a cookie with apples in it, so now I must try these! I would love love love these because I’m a crust girl. I love apples, but it’s the crust that is the hook! It’s just like mini chocolate bars that have a higher chocolate-to-filling ratio. Yum! This is pure genius. Thank you for sharing. I am TOTALLY the High Crust-to-Filling Ratio type!!! These look like autumn heave, can’t wait to try them!!! These are too cute! I’m ribbon inept as well, no worries. We have plenty of other talents. For me, the love of pie is all about the crust, so I know I would like your pie cookies. These are adorable! I’m going apple-picking in upstate NY this Sunday and these will be the first things I make! Thanks for posting. Love it! Pie + cookie = pookie. No? ZOMG sooo cute. I’m kicking myself for not checking this 30 minutes ago. I just put an apple tart in the oven. I am a crust lover, so this is looking really delicious right now. These pie-cookies seem like they would be a fun weekend afternoon project. Usually when I try recipes that require homemade dough making, I block out a large portion of my day knowing well in advance that they will be neither quick nor easy. I find as much joy in going through the process as I do in the finished product. So thanks for sharing. PS. I am ribbon inept too. Mine always end up looking like a floppy mess. Deb, I’m loving the apple theme! I sent your apple challah recipe to one of my friends, and he absolutely made it and brought it to a dinner party and we all loved it. Clearly you’ve lost it with this recipe, but as soon as I saw the first picture I knew I must make these immediately. TODAY. Onto the store to restock on some apples! Things in miniature are always adorably irresistible, so I think you made the right decision posting these bad boys. I went apple-picking recently and am looking for something to do with my 30+ pounds of apples (seriously). I’ve already made applesauce, which made a pretty considerable dent, and now I’m thinking that a smaller, but equally delicious dent will be made by apple pie cookies. Yum! OK – Now another thing I’m going to love to eat. I love the way you think out of the box. These piookies (is it ok to call them that?) sound fabulous!!! Your writing is so fluid, your photos so fabulous, and the food… Indeed, the food. I’ve been craving apple pie for 3 weeks. I was trying to figure a way to make apple pie and share it with the coworkers so I wasn’t forced (!) to consume the entire thing by myself. Perhaps I’ll attempt apple pie cookies, instead. I imagine they’ll travel and serve somewhat more easily than pie. By the by. When you finish your book, you should seriously consider visiting the Northshire Bookstore in Manchester, VT for an event. They’ve done several cookbook events, and I recently came home with a pie cookbook from just such an event. These moving STAPLES ads are making me insane! Wowzers those look/sound spectacular!!!! I must give them a whirl soon. Bon Chance with the book! I love apples and hence I LOVE apple pie… Unfortunately the rest of my family does not. This may be the answer to my predicament! Cant wait for that cookbook! LOVE!!!!! after reading this I jumped up and am making them right now!!! I just went apple picking with my 6 year old sidekick this week and I couldn’t contain myself! :D yay!!! Missed you Deb! I kept periodically checking your site just in case my google reader feed had screwed up and I was actually missing your posts. So glad you’re back. Now when I find myself with some real down time one weekend I’ll have to try my hand at these adorable little ” tookies”! These cookies are blowing my mind. Can’t wait for your book, you genius genius woman you. I’m confused – how much ice water do you add when making the dough? Can’t wait to tackle these this weekend! sara — 1/2 cup. Sorry if that’s not clear. Sheesh, Deb..if I hadn’t happened across your facebook page with an explanation, I’d have thought you’d abandoned this blog! I was gettin worried..and a little shakey for somethin’ good to read, let alone bake. What? You can’t do it all? Well, welcome to the rest of the world. These cookies look adorable. These look and sound incredible. I wanted you to know you’ve been missed and it was fantastic to check in today and see a new post from you. I really needed a Jacob fix!!! Best wishes as you approach the finish-line with your cook book. I can’t wait. These look amazing! But more to the point–I want to wish you encouragement in the final stages of working on that manuscript! Especially because this blog is a lovely break for me while I’m working on a writing project of my own. Good luck! These are absolutely adorable and they sound delicious! Pretty sure I could eat 10. I can’t wait to pre-order your book! It’s funny that the post 5 years ago was Acorn Squash with Chile-Lime Vinaigrette, since I just made that recipe (again) the other night. It amazing me every time! Even my husband loves it, despite the fact that on first glance, he inevitably asks “what is this?”, “is it a vegetable?”, and “do I like squash?”. How awful would it be to use store bought crust? yum…and what a wonderful re-entry you’ve made with this recipe. We’ve missed you too! Can wait to make and devour these! these sound amazing, and i am all about a high crust-to-filling ratio. may have to have a go at these for thanksgiving! These sound adorable. And I hope this doesn’t come across wrong, but it’s sentences like the following that I love in your recipes: “You are very likely thinking I’ve lost my mind by now and you may not be terribly far off.” Please keep them in your book. Gorgeous as always. Such a lovely idea for a dessert buffet- these, a few mini panna cottas and a big pile of deconstructed florentines (what I’m calling piles of dark chocolate, almonds and sour cherries for piling up in little cairns). Deconstructed florentines is losing it. This is just lovely. I’m actually making an apple pie this month as part of the “Birthday Pie of the Month” give I gave to my husband for his, well, birthday. Different pie every month and I’m currently on month two. Yes, these may be time intensive, but so what. Sometimes different and adorable really do matter and you just turned a typical apple pie into little pieces of baking art! Details really can make it all worthwhile. :) Thanks for sharing and I’ll have to make these sometime soon for sure. P.S. Good luck with the finishing of your manuscript–so exciting! Oh, those are so adorable! I have been out of my mind with craving apple pie the last few weeks~ you are right, it is what one does in October!~ and this is perfect! I can’t wait to try this! :) Thanks for sharing this, and I hope you have a lovely day! most adorable thing I’ve seen all week (and I am an unashamed viewer of every kitten picture/video out there). I would smash a half scoop of vanilla between two of those so fast your head would spin. Now we know the origin of the words “cutie pie.” Oh my! Holy Chicken. I just got home and saw this recipe and instead of lunch all I can think about is mini pies and all the things that could go in them. This could work for so many things. That being said I am slightly frightened by the whole “line up six small dishes” section. I am torn – I think crust is the best part of the pie but this might have to be saved for a day when I have already eaten lunch. So excited you’re back! I think I might take Sophie’s (#20) suggestion and add lollipop sticks to make pie pops, these would be perfect for a party! (or to hungrily eat as soon as they come out of the oven). I have just discovered this blog and I have to say, I LOVE, LOVE it!!! It makes me want to forget about art and just cook. But I consider cooking art as well, so this site makes me doubly happy! Can’t wait to try some recipes. Woahhh.. These look awesome.. I know what I’ll be doing over the weekend. I cannot tell you how unbelievably adorable and scrumptious these look. I must try them! holy toledo! this is the kind of insanity that could save the world! Oh wow. I thank you. (my waist will not thank you but I do have loose fitting jeans so my waist doesn’t get a vote). These look perfect. I think I have found my new favorite blog. Oh wow! Those look amazing. I wonder if there is a way to freeze them, so that I could parse them out through the month and not eat all of them in one go. This is totally want I want right now! I made something similar with pears yesterday, but the dough was a desaster. I’m will try your mini pies as soon as I get my hands on some apples. Thaaanks! Congrats on almost finishing the manuscript! You can do it and we all can’t wait to celebrate with you when you do. Thanks for all you’ve given me and my kitchen. I have been lurking on your site for well over a year and I must say that I absolutely love it and have learned how to bake solely through your site. Thank you. I love making pies because they are not my favourite dessert, but they are my boyfriend’s. Therefore, I can make him a pie, enjoy a few bites and then the rest is all his and I don’t suffer like I do when cookies become involved. I usually like to bake him something for the road when he heads out of town and have always wished pies were transportable. He leaves Monday for two weeks and I am absolutely delighted that you re-appeared with this recipe just in time. I can’t wait to make it over the weekend and send him away with some homemade love. Thank you. Oh my! Tiny pies–how could you ever say no? Genius!! I can’t wait to try it out. I made peach hand pies with your all-butter crust recipe with the last of my farm stand peaches a few weeks back. Heavenly. This sounds like heaven right here. Just magical! These look almost too adorable to eat! However, I definitely plan on making these as soon as possible! So glad you are back (or at least checking in)! I am constantly amazed at your ability to juggle projects and really glad the manuscript is inching toward completion. We are all cheering you on. (And these look delicious, but that went without saying). I love cookie pie so…pie cookies are right up my alley! No one can resist a tiny apple pie. Especially not me. We’ve missed you, Deb! I’ll admit, I totally made your last few recipes…but this whole complicated cookie/pie dough thing may not make it into my kitchen (sadly, oh so sadly!) this time. I’ll stick to your white chocolate salted oatmeal tasties in the meantime. Good luck finishing your manuscript!!!! My goodness! These are adorable. And ‘teeny tiny adorable cookie pies’ is definitely a fitting name. I’m going to steal this idea for when I make my pumpkin pie at the end of the month – partly because I’m terrible at cutting a pie evenly, but mostly because these are so (soooooo) cute. Welcome back, I missed you! Cutie pies! Freaking little cutie pie cookies…. OMG!! Way cute just like Jacob. Oh Deb how I missed thee.. Very cool and can’t wait to try.. Ps You were so missed in Southern Cali!!! These look amazing! I am going to save these for a wonderfully chilly weekend when I want to spend some time in the kitchen. Thank you! These look adorable. Perfect fall treats! Personal pie! The best sort. Love this! But I really want to incorporate caramel into it somewhere – tucked under the crust or drizzled on top? Because apples and caramel just belong together. And I love caramel. These look amazing. Such cute little pies! I love it. Hi Deb, I too was wondering where you were and then I thought book writing, look forward to the end result! These look absolutely adorable and as we are newly emptynesters I am trying to remember that I am only cooking for 2 now (most of the time) I look forward to trying them. My crust recipe is almost exactly the same except I use iced orange juice, and I freeze my butter after I cut it into small 1/2 inch or so pieces (I do use a food processor to pulse the ingredients) and I find that a number of factors contribute to the amount of orange juice is needed, like humidity, flour, the “stars” etc. but i generally need about 1/2 cup. I’d like to try some cheddar in it but the last time I did (Martha’s recipe) the crust was tough. I’d also like to try some raisins, walnuts and crystalized ginger. yum….PS the Apple Honey Challah is great, tried it with half whole wheat pastry flour, really nice…. congrats on being soooo close to finishing your manuscript. These little apple pie cookies are about the cutest thing I’ve seen in ages. I want them! Take another dough disk with apple & sugar mix & place on TOP OF THE 1st DISK? Then cover with another disk? Total 3 disks of dough per “pie”?? Sorry for not understanding but I wanna give these bad boys a try tonight!! Welcome back! we missed you as well. Do cutie pies make you want to skip studying, work and a million other chores and spend Saturday making these? I should order cookie cutters though–Any suggestions? ALteco seems to be have a dual sided one, but it starts at 2 inches..maybe I need both fluted and round? decisions, decisions. I think I have a million ideas for fillings- peanutella, pumpkin butter etc..not sure if they will be soggy or awesome, but no harm trying a couple out :) I have never made pie..only tried your apple tart once, but it is crazy cold here and I need me some pie. Arti — I think everyone who likes to make cookies or biscuits or scones should buy a set of these. You might never need cookie cutters again. I cannot wait to make these! They are the cutest, prettiest little cookies! and I thank you for all of the preparation details-I need them! BTW I am SO excited and can’t wait until your cookbook comes out! Can it be now? Those remind me of the little apple empanadas my boyfriend makes! So adorable, artistically made, and perfect for fall! I am completely dough-phobic, and this was AWESOME. I LOVE no lard/shortening in a recipe. They are in the oven right now, and the look on my husband’s face coming home to pie-cookies was priceless. Thank you! Very cute. They remind me of the chaussons aux pommes my mother makes. It often upsets me that the one thing missing from a good apple pie is a good dough. So the crust to filling ratio is just right for my taste! Power to you with going with your gut, and voting for cute over rational. My stomach will thank you after I make these for myself. Yeah, you are back! And these are awfully cute. Hi,I want to tell you that your blog is great,my favorite.I live in France and I find very usefull when you use grams in your recipes.And one question-why do you mostly use dry yeast,is it hard to find it in USA? These are so beautiful and rustic and lovely! There’s…nothing to stop a person from frying these instead of baking them, is there? Other than perhaps the vaguest whiff of sympathy for one’s arteries? It is indeed nice to have you back! Now, for the very appley-ist of us ..what would happen if you used two slices of apple per pie? Goo or good? Marcia — It would be delicious but make sure you then have 3/4-inch size difference between the apple round size and the crust size it will be hard to crimp the crust around it. Just when I was about to settle on making something boring with all the apples I picked over the weekend you (as ALWAYS) come up with a perfectly timed, brilliant, and totally un-boring recipe. You have become (as I’m sure you have for many others) my first stop for inspiration for any and every recipe. Can’t wait to buy your book!! Did you really have to? I’ve never had success with pie crust, and you do this to me? *sighs* Don’t worry, I still love you. We miss you too! And I love pie in every form… ever! So, thanks for posting this:)! I will not be cursing you because I live for overly-complicated recipes; why else do you think I love your blog? :-) I think I might make these tonight! I’m always in awe of every cooking recipe here at smitten kitchen, but the baking ones tickle me pink! And as an amateur baker myself, I am inspired to tackle pie crust with your reassuring guidance :) Anything small, apple-flavored, and involving “cute” crimping demands a test run in my kitchen! i am such a sucker for baked good hybrids!!! ACH. You went there. I can’t believe you went there. But I am so, so happy that you did. Cannot WAIT for the book!!! could you imagine making this a savory dessert by putting cheese and apple filling or quince and apple filling – kind of like romeo & julieta? I think it would be delicious! Oh my do these look delicious and worth all the trouble. Thanks. These look utterly delicious! Just starting work I haven’t had breakfast yet (I eat while at work) and I want these!! These are adorable, but what really boggles my mind is that I’m constantly on your blog and whenever something new posts, I can’t get over how I’m not even close to one of the first commentors. How is this possible? Wow that seems like a lot of work! But worth it in the end, that’s for sure. They are in the oven as we speak! I just couldn’t resist!!! Any ideas for the apple scraps other than a snack while I wait impatiently?! Olivia — I gave them to the toddler. And ate a bunch to distract myself from eating ALL the “tookies”. Hooray, these look amazing! Lovely job, Deb! These look like beautiful sand dollars…love, love, love! Oh my goodness those are the most adorable things I’ve ever seen!!!! Gorgeous and picturesque. Genius. You are a cooking genius. These are the cutest ever. Your mind works in wondrous ways. However, I can’t make these as I am pie dough challenged. Learning how to make flaky pie dough that doesn’t taste like tough cardboard is on my bucket list. So you bake and freeze or freeze without baking? bite sized pieces of pie. yum! Made these tonight, they are so worth the trouble!! I need to make more this weekend to bring to work on Monday, they disappeared rather quickly! You are a frickin’ genius. I needed a really cool recipe because I just picked a bushel of apples, and this is great. I can even send them to my daughter at college. Maybe put a half a Kraft caramel in each one before baking….? I absolutely, without a doubt, cannot WAIT to add these to my ever growing fall cooking list!! Can I just say.. BEST COOKIE IDEA EVER!! Holy crap, these look insane! And right after I wear that damned dress to the damned party and dump this damned diet I. WILL. MAKE. THEM. I’m a pie crust kind of girl. These look heavenly! Within 5 hours of reading this I had made a batch and given some to neighbors. They are so great! I’ll definitely be making them again…thanks! I’m usually very opposed to postings by people who have not yet made the recipe, but after reading the comments I can’t resist… I was reminded of an article from “The Onion” many years back …”With nearly three weeks having passed since talk-show host Oprah Winfrey last issued an official command, approximately 60 million Oprah Winfrey Show viewers are on standby, stationed in front of their television sets and patiently awaiting further instructions from their leader.” I thought the “break in the action” was great- lots of folks were using the “surprise me” option or, if like me, trying out different recipes that fit their needs (i.e. what they have fresh) so the comments thread offered even more varied suggestions and inspiration (thanks, folks!). Oh, welcome back, Deb! I’m planning a trip to the local orchard soon and have been compiling apple recipes to try out with the results. These have just moved themselves to the top of the list, they look amazing! I want to put 2 of these together with a scoop of ice cream in the middle! Oh man. These look great, especially as a breakfast cookie. You know, a breakfast cookie. What? Don’t judge. But, I have to admit I stopped reading at “Line up 6 small dishes.” Six??? Sigh. Maybe I’ll just stick to breakfast pie. lovely! I recently read about a trick to put vodka in pie crust instead of water to increase the flakiness. Have you ever tried it? cute pie cookies. and undoubtedly tasty. I have made these for years when using up leftover pastry, but i have never called them cookie pies or tookies before!! Thanks for the new name! If this is what losing it looks like, you should stay lost. I had a thought- Kim Boyce’s Apple Butter would do wonderful things inside your crust. Deb. I just wanted to inform you that you are totally brilliant, in case you were not aware. These look perfect – autumny and delicious and so, so cute. Even without tasting them, I am such a fan of how adorable they are that I updated a blog post I wrote a month ago about Things That are Twee to include these cookies. Piekies? Something. Anyway, somehow everything you make becomes everyone’s new favorite recipe, and I know that your book is going to blow us all away. Good luck as you finish the manuscript! I so wish you could use real French butter which distinguishes itself with a nice yellow halo and a deep buttery flavor to give those cookies the authentic flavor they deserve… Those white butter sticks just have no personality in the kitchen. i bought three bags of apples for no reason at all this week, and i’m now panicking and scouring the internet for ways to use them up. this is perfect! very cute. holykamoly! Cant wait to try these out!!!!!! I just got a bunch of apples from costco and I know what im gonna do with them. Thank you! I just tried the dough for some cherry tarts, I love it! Wow….now this is smart. Very smart. Way beyond Martha Stewart clever. A real winner! How incredible-I am ALWAYS looking for a smaller version of sweets as my family can never seem to finish things I bake!! My daughter’s first grade class is always clamoring for snacks on “Fabulous Fridays”! I’m so excited to try them. We’ve missed you too-can’t wait to see the finished cookbook!!! Deb, thanks so much for this recipe! The hubs and I went overboard when we went apple picking so we have a TON of apples (perks of living in upstate NY! :) ) so we’ve been desperately trying to incorporate apples into everything we consume…I doubled the recipe and brought it to work. Huge hit this morning and it’s only 8:30! I also loved your commentary (such as, “at this point, you probably think I’ve lost my mind,” etc.) Your Mom’s Apple Cake is next on my list… then it’s time to try my hand at apple butter. Per Usual, thanks for a great recipe! I cannot wait for your cookbook to come out! ahhhh i love these!! the crust is my favorite part and i’m definitely making these at christmas time! These are the cutest little cookies ever! Love them! I love these! I have made them before, except I added a round lollipop stick and created Apple Pie Pops! I have taken them to lots of pot lucks and parties and everyone loves them! it is very similar to your recipe (although I think yours look prettier than mine!). I do the same with brownies…only use popcicle sticks! I’m new to your site, I love it! Thanks for telling me I CAN make pie dough, I just have to put it back in the fridge & stop fiddling with it. I’ll be back to read more! Yum and thank you! Yesterday (not having seen your post yet), I asked my husband if he’d rather I make apple pie or cookies. I’m 9 months pregnant and on a baking (and eating baked goods) CRAZE. He said Apple Pie Cookies and I did not believe at him first! Your recipe was perfectly detailed and surprisingly quickly we were enjoying the cutest and most delicious pie cookies! Thank you! Plus I feel so pleased with myself for having made them. And hope that soon I’ll be too busy with a newborn to make such things! I was just looking for a recipe to use up some left over pie crust dough and this is exactly what I needed. The leftovers just made 8 little apple pie cookies and they are in the oven as I type. The pie is for a party tonight and I am craving some as the whole house is filled with this delicious pie scent. So they are just perfect. Can’t whait for them to be done. Genius! I am so glad you wrote about this, because now the possibilities for pie cookies are endless! Amazing, as always! This recipe looks great! but is there an alternate way to finish it without the egg wash? I have a friend who is vegan and can’t eat my cookie concoctions! This recipe would be great if not for the eggs at the end. Why oh why did you have to post this of today of all days? (sigh…) You see I’ve been craving pies, teeny tiny hand pies to be exact. For the past TWO weeks and our lovely amish baker from the farmer’s market did NOT make any last week. But I so did not want to fry hand pies as the oil lingers in our house (no outside venting fan or even one with a filter.) So now this afternoon I will HAVE to make these delicious bits of heaven between finishing up the senior photo board, senior/parent football recognition/photo shoot, decorating a cake for the sophomore class project, and tonight’s football game. But it will be so worth it to have for tomorrow’s marching band regional competition! GAAAH these are just the ticket for me. You see my hubby can’t eat pie anymore :( and well if I had these in the tookie form, I’d not have to eat a whole pie – just 1 tookie at a time! Deb, I love this recipe! I made it last night with some alterations: roasted the apples and then put them in as small chunks, so that I could double the amount of apple I used up; also I made the circles bigger and just folded them in half, like apple turnovers I guess–delicious, though not quite as pretty as your version. Thanks for the inspiration! Also, great advice about keeping pie dough cool. I also roll it between sheets of plastic wrap, and that makes it easy to slide it to the freezer for a quick cool-down. oh, I love this idea and I’m already toying with ideas for variations! Egg wash –It adds glossiness and helps with browning. It’s mostly aesthetics and can be skipped. Savorique — Yes, French butter is wonderful and there’s no reason not to use it, but I can assure you, that even these regular old American butter sticks made a fantastic, delicious, intensely flaky pie dough with this technique. Part of the reason I use them is that it’s what most people keep around, and my results might be different if I were to use a butter with less water and more fat. My goal is for everyone to have excellent results with the recipe, with the ingredients they likely have on hand. For many people, butter that runs $3 to $4 for a stick is out of the question. countrymouse — I have. I did a post on it but the next year, went back to this method. It just works better, and more consistently. Re: six small dishes — Funny that this is a deal-breaker for so many. I was hoping it would make the process easier, and more efficient just to have an assembly line ready. Or, at least it helped me. These looks beautiful. And really, we saw the 12 layer cake and the 7 layer cookies. This is not more exacting than those, so it is all good and delicious! I made these last night and they were a huge hit! So much fun to put together. And there was one step in the process that I really have to thank you for. The suggestion to toss the sticks of butter into the flour straight from the freezer and break them up with a pastry cutter – without cutting them up into chunks first – was a revelation. My pastry dough has never come out flakier and it’s a tip I’ll be using with every pie crust I make from here on out. Thank you so much! Keep up the good work! What if you grated some not very soft cheddar into bowl and sprinkled a bit under or on top of the apple, or on top of each tookie? These look amazing! Do you dampen the entire bottom disc or only the edges? binnie — The whole disc. Only very little. Seemed less fussy than just trying to dampen the edge of such a tiny coin. You’re forgiven for the long absence, SK. These look delicious. deb, i love you. i love your writing. i’m not the greatest cook, but you make me feel like i can do anything. thank you. So neat, but i am dreadful at making pie crust…. Would it be total SK blasphemy to use Shoprite’s refrig pie crusts?? This recipe is adorable! I wouldn’t have thought to make individual pies, but this looks perfect for a little girl’s tea party. I’m excited to go apple picking this weekend now. Thanks for the great recipe! These look delicious! I saw a similar recipe at my new favorite blog, pie-eyed.com — mini-pies are trending! Don’t judge me, but could I possibly get away with one of those pre-made pie doughs like pillbury for these cookies? I do cakes just fine, but pie crusts… they get me everytime! Yay I’m so glad you’re back! And with this stunner of a recipe! I can’t wait to make these. They would be the perfect end to a fall dinner, with some warm apple cider on the side. Or is that too much apple? Is there such a thing as too much apple? These are AWESOME! It’s a wonderful idea! Your side kick is onto something, “Tookies” pies maybe the new rage. They are precious- you’re right! I am so glad to have this cute little idea on hand for a fall gathering where people can just ooh and ahh over the cuteness. Thank you- and congrats on being so close to finishing! Would vegan margarine or non-hydrogenated shortening work better for the crust? Or a mix of both? This recipe looks AWESOME but I’m still searching for a great vegan crust recipe. The cakes look so delicious, it’s a great idea. And beautiful photos. Can I just put this crust in mini-muffin cups, fill, add the crust on top – of course cut with a smaller size cutter – and make apple pie muffins? I love your site and recipes. Just made these last night–they are seriously legit. I actually fell for this dish twice- once looking at the first picture and then hearing the 6 dish prep step. The geek in me loved that. Now if only I had ponied up an extra 3$ for one day shipping, I would have my cutters today and would be making this tommorrow. Oh well. I work with a kids’ group at church, and one of the moms brought in apple pie cookies as a snack for the kids. I rarely partake of the snack, but that night I ate two of them. They were so delicious, I was just sitting down to look up the recipe when I saw you had them here today! I always check here first when I’m on a recipe hunt. Thank you! THESE LOOK SOO GOOD! I’m going to make these for Thanksgiving for all the complainers in my family who never want a whole piece of pie! plus they are really cute and will look good on a dessert tray. These look amazing!! I can’t wait to give them a try. These would be absolutely perfect for the club bakesale on Wednesday. Especially with your tip for how to freeze and bake them later. :-) I may have to get started making some of these, although I’m tempted to substitute homemade applesauce for the filling, with a little bit of something to thicken it up so that it doesn’t glop everywhere during the baking process. Ok, just pulled these little guys from the oven (a vegan pumpkin version) and I have to say, they look SO. MUCH. NICER. than the empanada shaped pies I made last week. Thank you, Deb! Naomi– Regarding the gluten-free version, I haven’t made these yet but I’ve had really good results making Deb’s recipes using gluten-free flour blends that can be substituted cup for cup with regular flour. The recipe for the blend I use most often comes from “Gluten Free Baking with the Culinary Institute of America” by Richard J. Coppedge. Sometimes gluten-free baked goods don’t brown as well as regular ones, but the egg wash and sugar in the recipe should help with that. I made these this morning. My family loved them. I had some apples from apple picking on the weekend so I just made these. They’re a big hit! I’ve done these so many times, too! In fact, taking some to a demonstration tomorrow. Love ’em. practical smactical, go for dessert first! Oh my sweet lord! These are the most amazing looking things in the world. Believe it or not I’m camping in Southern Oregon, (with internet connection because I am, after-all, a workaholic) but as soon as I get back to San Francisco, I AM MAKING THESE, even if it kills me. I made these very shortly after reading this last night, since your post and my box of homegrown apples from my dad arrived at nearly the same time. SO good! and SO cute! By the way, the six dishes description really just clarified everything and made the assembly a no-brainer, not a headache. These look like so much fun! Apple pie and cookies. Together. Amazing. OMG Deb. These look insane. I love it! question: do you think these would travel well? If I do send them, well-sealed, do you recommend nuking them in the microwave to warm them up, throwing them in a warm oven, or something else? Hi RK — I think pie actually does best uncovered or it gets soggy from moisture escaping and getting trapped in the container. Oh my, you have out did yourself with these! How clever and creative! Love it. I’ve never had success with anything apple. My apples always turn out dry like carboard. I’ve read other posts about what type of apple to use but can’t find them in Canada. Any suggestions? thanks! adorable!! excellent work! it is SO apple pie time! these cookies are an adorable and original take on it. I almost took off my thumb making these (stupid mandolin) but they were totoally worth it! So cute and delicious! okay so you`re a genius. These are such a cool idea! They look lovely. Just made this recipe today. Turned out wonderful and were actually pretty easy to make. Taste great and my friends loved them too! I MUST try these! They look/sound delish (and are super cute to boot)! ! ! ! Twee? Absolutely. But also creative and inventive and by all accounts, absolutely delicious. Please don’t ever second guess yourself again. Just share! These look amazing, what a great idea! Made these delicious little beauties yesterday! They were delicious!!!!! 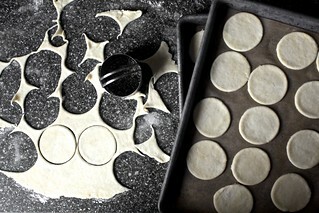 With a 4 month old baby, to make life easier…I used store bought pie crust. I also added brown sugar to my seasoning mixture for the apples. They really were amazing little creations. My husband loved them as well!! Looking forward to your cookbook! I lost all of my cookbooks in a fire on the night our son was born so yours will be a perfect addition to my new collection!! Thanks for the pie dough tip. I forever have thought my hands were cursed when making pie dough… and they probably still are, but at least you have offered me one more tidbit of hope to try again. Cant wait to try these out on the fam. I especially love your “yield” note! Thanks for keeping it real! Best of luck with your manuscript! The mini pie cookies are so clever and look yummy. Genius. Absolute genius. So excited to make these. Wow, these look amazing! And I was just looking for a recipe with apples, however not in the mood for fighting with crust so I’ll just op for your apple and cheddar scones from last year. Will try these evntually though. Oh, these are cute! They remind me of our Dutch “appelflappen”, they’re almost exactly the same, but those are puff pastry (I’m really not sure what kind of pastry pie pastry is, or if it’s very different, but it looks very similar in the picture). Wow so only 1 piece of apple per cookie? (I just now read thru the recipe…) How ingenious!!!!!!!!!!!!!!!! Just made these. I needed more water than is called for, but otherwise, they came out perfect and quite beautiful. However, there is NOT enough apple in each one – you barely got a taste of apple in each bite. This was disappointing. Not sure if i would make again. Genius! These are in the oven right now. I loved assembling them. I felt like The Baker Giant making pies for the little folks. My kitchen smells wonderful. And yes, the apple scraps are the perfect thing to munch in anticipation. Made these today. I needed to throw an extra tablespoon of water into the dough for it to come together, but other than that, made them exactly as the recipe called for. My husband and together ate six of them in less than 10 minutes. They are THAT good. First pie crust I’ve ever made in my life. For a girl who typically eats dough scraps off of the flour board, these were worth waiting for – delicious and slap-your-sister adorable to boot!! Thanks for another great recipe! I made these for a get together this evening. I’ve never made pie dough before, but your encouragement made me decide to go for it. It was surprisingly easy. The whole time during assembly I was thinking, I’m crazy for doing this much work when I could just go and buy an apple pie. And then I tasted one. O…M…G…..I don’t think they will last until tonight. So thank you for giving me an excuse to bake goodies, and curing me of my fear of dough. I see many pies in my future as well as larger jean sizes. @calgary dentist – I like Granny Smith apples for baking since they don’t taste super sweet once they’re done, but honeycrisp apples are great too! I typed in this web address, holding my breath, thinking “I hope there’s a new recipe today” and I saw these cookies and went “Oh!! !” I love to spend fall weekends baking and these are perfect- thank you! Made these today! Beautiful, but…I have five children, and a husband…they’re gone, and they just came out of he oven 1 hour ago! I love you. I am baking weekly for a coffee café at our church, and was looking for something that said “Fall”. I’ve done pumpkin this and that, so this is perfect. Thanks for all the great recipes you’ve shared with me, personally. (My family also thanks you.) Looking forward to the cookbook! Absolutely Beautiful! I love this post and the photos are incredible. Such a lovely Fall post and something to get us all excited for baking for Thanksgiving and this wonderful chilly weather. Deb, One thing – I don’t see in the recipe where you used the smaller cookie cutter – sounds like you cut them all at 2 1/2-inches, and just pinched the edges together like an empañada. If you did use the smaller cutter, did you flip the extra dough from the bottom piece onto the top & crimp? Sorry for the questioning of a perfect recipe…just want to do it the easiest way possible, since I’ll be making a bunch. I made these, and they turned out absolutely amazing! One thing you can do is broil them for a couple of minutes. Keep an eye on it though, they might burn. That’s the most adorable idea I’ve seen in a while. Absolutely love these! Thanks for the fabulous idea! I have been making a similar small round pie, but a savory version. I use leftover pot roast, with the gravy & veggies all chopped up. But mine weren’t as attractive cuz I didn’t use the glaze. So now I’m thinking of a thin slice of potato with a thin slice of pot roast on top. For sweet, peaches are yummy, but I suspect too juicy, what do you think? What a great recipe! I love apple pie but sometimes can’t justify eating an entire one myself (sometimes). Assembling the first batch was labor-intensive but still fun. The second round went much faster so thanks for the honest heads-up. In fact, I cackled with glee when pulling the second out of the oven because they looked and smelled so wonderful. A non-scientific test of 15 seconds in the microwave resulted in that “just out of the oven” warmth while retaining the crisp of the crust. I’ve been reading this blog for about a year now…and my gastronomic pleasure has increased exponentially ever since! I just want you to know that my first batch of these “cookies” are in the oven and looking beautiful. I can’t wait. My best piece of advice: Make sure your cookie cutters are an acceptable size. I used wine glasses because I didn’t have round cookie cutters (hearts – yes, stars – yes, miniature goldfish – yes, thanks to Smitten Kitchen), and my first round was too small. omg! i have never made a dessert before (past the recipe on the back of the chocolate chip cookie bag), and these were 110% successful. i found the crust 102 all butter, flaky dough post, and crust 103 rolling post, very helpful. i’d strongly recommend reading those through if you’re new to this. i didn’t have a pastry blender- i saw online you can substitute 2 butter knives, i did that for awhile, but then got fed up and worked through the dough with my finger tips (very quickly, so butter didnt melt). your tips for lots of flour and popping dough in the freezer were excellent. i didn’t have a cookie cutter, so i used a juice glass. that worked well. i cut both circles of dough the same size. i didnt have a smaller size for the apple, but most of my discs were small enough to fit. the ones that weren’t, i just broke into pieces. i didn’t have a rolling pin. i tried to use a drinking glass, but needed to put too much pressure on and was afraid it’d break. tried to use an espresso can, but again, needed more pressure. eventually broke down and bought a rolling pin. for $10, the process became exponentially easier.. its well worth it. after 20 minutes, i found mine were actually a little doughy/soggy on the bottom. it may have been because they were bigger than whats pictured (~4-5 in), or because i was too generous with the water wash. i bravely flipped them over for the last 5-10 minutes. worked perfectly, they all crisped and nothing broke apart. since mine were bigger, and i only have 1/2 recipe of dough, the yield was about 7 cookies. i was surprised and alarmed to find 10 people at the dinner party– but solved the problem by slicing them in half. they held up extremely well, didn’t mush or crumble. MUCH better solution than having some people politely decline one. everyone raved. i didnt even manage to get them all on a plate, let alone take a picture, before they were gone. thank you so much!!! I cannot wait to try these! I always loved my mom’s fried pies but wasn’t able to make them like she did. Maybe these will stop the craving. I have a very similar recipe but with puff-pastry dough as the quickie shortcut. And I’ve been pushing off making it forever, but if you can do it with real dough, I have no more excuses! Thanks for reading my mind! I’ve been making pies for more than 3 decades and always regretted not being able (well, not un-able, just too embarrassed) to eat the whole thing myself. And as one who cannot get too much (or even enough!) crust with the filling these seem beyond perfect. Off to give them a try instead of cleaning the house. I mean, what’s more important – the joy of eating a whole, fresh-baked apple pie or clean bathrooms? I was inspired and tried these again this weekend – with your all butter crust. Your pictures look so brown and crisp and yummy. And I REALLY want to be a convert to all butter crust. I didn’t hit it out of the park. :( Have you had trouble with the butter pooling on the parchment paper while they baked? Mine sat in a big pool of butter, resulting in chewy bottoms (but really good taste!). I’m going to try again and make the crust in a food processor (doubting my by hand technique). LOVED the dip then in cinn-sugar tip!! Emily — Pooled butter means that the pieces of butter were still too big. Work them a little smaller next time, you should not have trouble. Good luck! Kate — Whee! Great minds obviously think alike. Hope you’re well. Made these last night, and they are AMAZING! It took me forever to assemble them, mainly because I didn’t have a cookie cutter for the apples, and I was worried they wouldn’t be worth the effort. They definitely, definitely were. Thanks for another stellar recipe! Holy heck… I don’t care if they’re twee. I WANT. Those are amazing. I’ve been craving apple pie, but my oven is a toaster oven. These will fit in my toaster oven. I don’t think you understand how you’ve made my life better. Consider me inspired! I have to try these. Just made these – absolutely amazing!! Didn’t get too technical with the 6 bowl production line, nor cut the little discs of apple but rather cut them very fine instead – wish i had done circular as apple ended up a little angular! Made them for Dad’s b’day today – and he loved them; love from the uk! OMG you guys! Deb you did it again. Just made these and they are FABULOUS! Can’t wait to bring some into work tomorrow….if any make it through the night. Apple pie in a COOKIE form? Heck yes! Thanks for sharing this because these will definitely be made at my home sometime in the near future! Deb, these are AMAZING!!! Had to add butter to the crust (not necessarily a bad thing!) to get it to reach the “small pea” state, but they look just like yours. I had to leave the kitchen as I reached for my third as reward for cleaning up. Thank you for a great idea, beautifully interpreted and communicated! This is the first time I’ve made a recipe that actually looks like the picture! Thanks. This was a fun project to do with my daughter, and the six bowls definitely made it easier. Made these tonight. Definitely worth the time it takes! So, so delicious and so easy to substitute apple for almost everything! Only used 3 bowls, used a cup to cut the crust and a tablespoon measure to cut out the apple discs and it worked perfectly. Just made them. They taste as good as they look! A little time consuming but definitely worth it. On my way down the road to pass them out! Love the idea. Tried them out today as a lazy Sunday afternoon fun project…and man, are they good!! Thanks for sharing another great idea. I made a few of these with some leftover pie dough this weekend and they were wonderful! What a great idea! Hi Deb, we missed you, can you tell? Thanks for checking in. Kisses to Jacob! Oh delicious! Crisy outer with moist sweet innard. YUM! I just made these and when I was watching them bake they were leaking what had to be mostly butter – streams of it. I was sure they were about to come out mediocre because after all, this is the first pie I’ve ever made and I had to improvise on a few steps (e.g. : my rolling pin = a roll of aluminum foil). My husband and I just made these. I subbed whole wheat flour for the crust. They turned out great! Thanks for such a great recipe. My father is a fanatic about apple pies and enjoys any dessert with apple in it. I’ll makes these for him on my next visit. These seem to have the perfect pie crust to apple ratio (I usually eat pies as an excuse to enjoy the crust). wooooooooooooow! these look amazing! i have to try them. Those cookies are so cute I could just eat them up. Oh wait, that’s what you’re supposed to do. Well anyway, they look great. can’t wait to try these–planning to freeze most so I can pull one or two out at a time! Who just rocked her first AWESOME all butter crust – this girl! Thanks for the tips, Deb. That was my problem – the butter needed to be way smaller than I had anticipated. I also did a pure Palm Oil shortening/butter with success, so I’m still a little torn on what my favorite is. But a HUGE thumbs up to the taste of your all butter crust. THANK YOU! I bought a refrigerated pie crust for this and you know what? It was delicious. I’ve tried making an actual pie with a store bought crust and was very disappointed, but for cute mini apple pie cookies a store bought crust was perfect. After peeling and coring the apples, I chopped them into small bits with my food chopper thingy. That way there would be no worry about the size or shape of my cookie cutter and whether the apple slice would fit inside. My kids had loads of fun assembling these. In fact all I had to do was peel and core the apples and they did the rest with me supervising. My only complaint is that I wish there were more! Haha. Bought two more pie crusts, as long as there are apples in the world we’ll keep making these. made these yesterday and they turned out GREAT! I misread the directions so there weren’t as many as I anticipated but I will be making them again!! Trying to think of other substitution/options! Make half the liquid for the pie crust, cold vodka. The alcohol makes the crust even more light and crisp. I made these last night and they were a big hit with the boyfriend. I think he ate at least 10 right out of the oven! I am so excited about this recipe! I will be hosting my first formal dinner party for 10 friends in a few weeks and these little gems will be the starring dessert! Deb, do you (or any other readers) have any suggestions for entrees? I want something delicious, but not prone to failure. This looks great, I wonder if it will come out the same if I use blueberries instead? This sounds so good it’s awful! I can’t wait to try this. Yay! ok so i made these last night. the minute i bit into it my brain said: THIS IS A MCDONALDS APPLE PIE. did your tastebuds do the same?! Thanks for a fun recipe. I love crust, but I think I like a little more apple too. These things are so cute though and they are pretty tasty. I liked them more the next day. Sort of hard to stop eating since they are so small! Wow! What a great idea! They’re sooo cute! This makes a great snack thing you can throw into your bag, and not worry about the filling spilling out like a slice of pie. You’re amazing! This really lets everyone have their single servings without worrying about “sharing” lol. Thanks! I have always been scared of baking, but this was such a great recipe I had to try it. I braced myself and went for it. I can’t believe how easy everything became after your tip about keeping everything cold. Thanks for this great recipe! My daughter made a batch just this afternoon and we are trying, unsuccessfully, not to eat them all in one sitting. My goodness, they are tasty! Love the the size! Crust was perfectly flaky! They are so delicious I. can’t. stop. eating. them. !!! Made ’em. Everyone LOVED them. Definitely worth the effort! After putting my 4 year old and my 5 month old to bed tonight, I made the mistake of checking smittenkitchen for updates. Despite utter exhaustion I could not resist making these little adorable pookies. I had all the ingredients on hand but not the right cookie cutters. Even that did not stop me. A stemless Riedel wine glass served as the cutter for the dough and an antique silver napkin ring cut the apple. My husband went to bed a while ago and I will have to lie tomorrow morning about how many of these delicious things I made. They are irresistible! Wow Debs, the pastry looks amazingly flaky for these, and overall so inviting. But I wonder, what would you say to those who like more filling? Could we put more apples inside, or a bit of cooked apple/sauce with the slices, or will that make them too soggy? Hi Michele — In comment #154, I respond to Marcia, who wanted to put two slices of apple instead of 1 inside the cookie. It could work and definitely amp up the apple flavor but you’ll want a bigger margin of dough so it can close around the apple stack. You also might enjoy hand pies, which were the original small pies and they have a higher filling:crust ratio. I have a recipe for them here with an even flakier and more tender crust. You could also use this crust in the same manner; it’s a little less soft. These are so awesome! i’m a bit obsessed with apples right now, so i might need to start cooking them instead of just eating them. Ok, I made them last night. My parents were there, my sister, my family (my husband and three boys), and my brother with his wife and five-day-old-baby. Everybody burned their fingers and tongues trying to eat them before they were cooled. My mom said they were some form of torture because they were delicious but you had to take little bites…in other words, they were loved and adored by all. People were grunting and moaning and quite pleased with me that I had made enough for everybody to have two. I know what I am doing with extra apples from now on! Freaking adorable! They would be an awesome treat to take to my knitting group! I’ve always cooked apple pie, but I never had not occurred to make cookies! Thanks for the idea, I will definitely try! Deb! Thank you. We made these last night, and they were awesome/blew away our dinner guests with their flaky, delicious cuteness. Somehow making tiny pies seemed so much less intimidating that a full-sized pie. I had some leftover chunky applesauce that we made a week ago, and I used a glob of that in place of the apple slice. Turned out great and saved me a few steps/dishes. I think I am going to try doing a version of these (or maybe the hand pies) as little savory pie cookies now…ricotta and spinach, maybe? Seriously, thank you. wow! i just got all the fixings to make and apple pie with a white cheddar crust, may have to save a little for these. brilliant idea! I made these last night and they’re already gone! The crust is so delicious and flaky. Made them with our own apples but Loren, I love your idea of trying out savoury fillings. These are adorable! Totally going to try this idea! Thanks! I made these last night for a friend’s birthday. They were amazingly darling and soo very yummy! And they were gone in about an hour. Thank you so much for sharing this! These were delicious! The crust is amazing. Thanks for sharing! Oh Deb and others… my sister-in-law just made quite a Smitten Kitchen mash-up by using leftover pop tart (https://smittenkitchen.com/2010/04/homemade-pop-tarts/) dough with this apple filling. Consider this an easier alternative, especially if you want to bake these with kids, since the dough is a bit more forgiving than pie crust. AMAZING! Thank you! This satisfies my crust cravings. I made them, cursing much of the time on account of all the time and labor. I told my family that I hoped they liked them a lot because I would never make them again. They were fabulous! Beyond cute. Wildly tasty. Very impressive. I will so make them again, although maybe make twice as many for once you’re set up, why not? Hi! I just baked these tonight! It took my almost 3 hours! I am not good at baking, but somehow I did it! They are little pieces of heaven! I love how light and flaky they are! Thanks for the wonderful recipe! I love desserts that aren’t overly sweet and the more crust the merrier as far as I am concerned. These sound amazing and worth the effort! These look wonderful- just like those little apple pies you used to see at gas stations (maybe that’s just MA? ), only 1000x better! I have to say just when I forget you’re out there (somewhere, in the blogosphere), you come back with a cinnamon-sugar-apple-dusted bang. These look INCREDIBLE. I only have a few apples left from apple picking of a few weeks ago which, I think, is just enough for this divine recipe. Seriously, I could eat these photos. Thanksgiving come quick! I made these cookies as soon as I saw them. The first batch made 25 cookies, which were gone in SECONDS. My family then spent the rest of the weekend begging me to make more…which I did, 50 in total. The second batch was devoured even faster. You are an evil genius. OH MAN. Why would you even consider not sharing these overly-precious tookie pies with us?! That really is a killer crust : filling ratio. Who cares if you can’t tie a ribbon? Girl, if you can make these while finishing up a manuscript, you are my hero for sure. I love miniatures. I’m making these and spreading some Maple Almond Butter on top ASAP! I made these with my own pie dough and they came out fan. tas. tic. Thanks for the inspiration, we have a new thing to try out at Thanksgiving! Must try these! They look challenging, but totally worth it. Wow these looks so great!! A lot of work but i bet these taste just wonderful. Okay not only was this the first thing I have ever baked but I did it with bootleg supplies on a budget and I have to tell you that it was absolutely wonderful! You recipes are always so good an constantly serve as a way to impress my girlfriend! This is great — I love to go apple-picking (actually went a few weeks ago) and I like the idea of doing something more creative than an apple pie. Adorable! 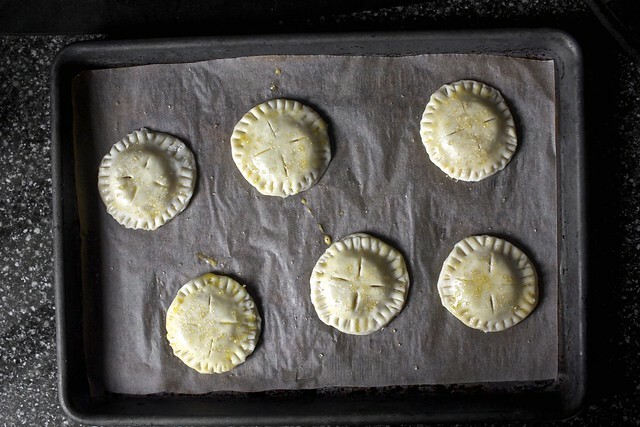 Oh — have you seen Dorie Greenspan’s recipe for apple pielets? They’re pretty cute…. These look absolutely delicious and like the perfect treat for fall! If only we were more talented in the kitchen to be able to attempt these for ourselves! I am still trying to resist making these, but it is getting harder by the day. Please, please, please post a new recipe so I can get these out of my head. Otherwise, I’m making these with the caramel pecan hand pies from Nov. Food & Wine. Yipes!!!! I’m losing it. i think this is exactly the sort of treat i’ve been looking for. small, simple and not that unhealthy. thanks so much! I made these last night for a group of girls in my Bible study. It was the first time I made pie crust from scratch, and, I must say, I was impressed with myself. It wasn’t as hard as I thought it’d be. Everyone went nuts over these little things. They thought they were so cute! My batch yielded about 24 and they were gone as soon as I pulled them out of the oven. Thanks so much for this delicious recipe! These were amazing. Perfect for a Friday night bake and booze. We cut teeny, tiny pieces of cheddar and put them onto of some of the apples, and then sealed ’em up and baked them. Delightful, probably the most delightful, and tastey thing I’ve cooked yet this fall. :) Thank you smitten! I just finished making these and they are amazing! I’ve never been that into pies, but I love these. I can’t wait for my family Christmas party so I can impress everyone with the amazing desserts I made!! Thank you so much! Okay. These… are so good that they are forcing me out of my 2-year-long lurkdom. Earlier this week, it was cold and rainy enough to make the first French onion of the season (yours), and tonight I couldn’t resist trying my hand at these… bites of amazing. The second tray is baking at the moment, and I’m contemplating just finishing the 3 left from the first. You know. To clean up. I will also add my voice to the chorus of the scalded. I thought I’d waited long enough. Nope. You need to call these what they really are: delicious little torture pockets. Love them, love smittenkitchen! I just love all the recipes (Especially the baking recipes). 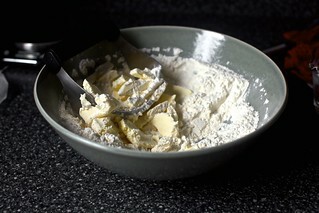 However I do have a small problem – all the measures are in US measures (1 cup, 1 ounce, one stick of butter, etc.) Is there anyone who knows the “translation” or knows of a “translation” homepage? Hi Tanja — I just added weights to the recipe. For the straight math ones (not ingredient) you can use Google! I.e. Type “2.5 inches in cm” in the search bar and it will respond with “6.35 cm”. I heart Google. absolutely delicious.. me and my mother made this together.. nyam.. yummy.. thanks for wonderful recipe. Made a variation of these, today. Cooked the apple in a sugar/butter/caraway seed syrup until golden, then added two slices per pie. You are a mad, mad genius. Very cute, indeed, an apple pie has been heavy in my head for some time. I was thinking along the lines of apple-caramelized sugar and pecans to one large flaky crust, though…does your sidekick enjoy standing on a dishwasher door as well? Oh my goodness, just way to cute. I fell in love with the idea and have been craving apple pie all week. I plan on trying this recipe tonight. I am loving your website and so glad I found it. I made these tonight for a football tailgate I’m going to tomorrow and they are positively outstanding! For my first attempt at pie dough, I was pretty pleased with myself. Thanks for an easy and delicious recipe! Yumm.Made these tonight and at the moment they are making the house smell like heaven. DELICIOUS. These look like beautiful ravioli and taste like Type II Diabetes. They were incredible. WOW! My husband is reading over my shoulder drooling….They look great!!! So I asked my friend whether she was a crust or filling person when it came to pie, but oddly enough, she’s a soggy crust person (who knew those existed?) and likes it when the juices seep into the crust. I showed her these cookies anyway and she thinks they’re precious and adorable and has bookmarked it BUT more importantly, she gave me an idea. The apple pie recipe I regularly use calls for a caramel-like sauce to be tossed with the apples rather than your standard sugar & cinnamon mixture. SO I think I’ll make these cookies and make a side of that caramel for dipping. I think that’ll be the best of both worlds – flaky crust smothered in delicious caramel. YUM! Also, modifying your 6 plate tip, when I make a recipe that requires breading something, I usually line up all the dry ingredients on some parchment paper so the only thing I have to wash is the egg bowl. Saves lots of counter space to for those of us not lucky enough to have spacious kitchens! Heading to the farmers market now to pick up some fresh apples. Will report back and let you know how they turn out! Welcome back! These look awesome (although not on my roster until the twins are past the teething/separation anxiety/destroying everything their sister has left intact stage), but I mostly wanted you to know – loved the line about it smelling like fall blew up in your kitchen. Full of win. I made your pie crust last week, great instructions! I have been afraid afraid of making crust after a few bad pies. You have given me back my confidence and for that I am thankful. With the extra dough I had in the freezer I finally made these. While in the middle of it all, I thought there is no way this can be worth it; My once clean kitchen, now covered with flour, cinnamon sugar and apple bits. I thought, ¨I will make them just this once.¨ All I can say is that my husband and I finished them before they cooled, not a one left to share with the neighbors. What a treat. For a couple of new parents like us this turned it into a big Saturday night. Thanks! Just made these pies this evening, and they turned out FABULOUSLY! I swapped in non-hydrogenated shortening for half of the butter (for a very flaky crust), which turned out beautifully. Not only were they adorable, but the higher crust ratio was a welcome change. And they are portable… pie on the go! Will definitely repeat this technique for other fillings. Dood. These took f o r e v e r. So good. I had leftover pie dough and tried making some cookies! They were amazing! But, i did not have a smaller round cutter so i just chopped the apples in pieces i thought would fit. I also mixed them all in a bowl with cinnamon sugar lemon and they released some juices which helped seal the cookies so i didn’t have to brush with water first. So, thanks for the inspiration and the delicious cookies! Wow! These look amazing, cant wait to try this recipe over the weekend. Thank you so much!!!! I made them over the weekend and they were great. My husband is not a big fan of apple pie, but this was so wonderful, he really liked it. I was scared at first, because I never made pie, but after going through your 102 lesson, it turns out these cookies are not that much work. But the effect is definitely worth the time. Now I have another wow desert. I made these for a party over the weekend, and they were such a hit! One of my friends pointed out that it was like “having your own toaster strudel”–which led us to postulate the many fillings that could be used with this recipe (nutella, strawberries and cream cheese, pumpkin pie, etc.). Thank you so much for this website and continuing to produce these incredibly innovative and fabulous recipes! Love love love! These!! By far the best fall cookies I have ever made. So much fun and easy to make with my 9 year old daughter. The best part…..no pressure for the “perfect” pie crust!! With so many possabilities it is my favorite fall cookie to date! They were beautiful. Great recipe. I’ll be trying this with lemon curd filling, pumpkin, etc. These are incredible! You’re absolutely brilliant and it’s such a joy looking at your blog everyday! If I were to ship these to a friend would they keep or go bad? Thanks for posting this recipe. The minute my friend Emily saw this posted on your blog it got automatically put on our “must make” list for our recent Apple Extravaganza. These look so good. I am babysitting Thursday and I think this would be a great recipe to make with them. I made these last month and sent them for preschool snack. They were a huge hit with the kids. We actually make these things in the Netherlands all the time. Only difference is that we use store bought puff pastry instead of pie crust. It’s great! Will try this one too. Yes! I am going to make these for my next book club! Absolutely loved these… They were FANTASTIC. Great recipe. Took much much longer than 20 mins for me to cook them, and the recipe itself is as high maintenance as can be but guys let me tell you. WORTH EVERY MINUTE! Apple pie cookies are an amazing idea! These look and sound amazing, like a all things cosy and warm wrapped up in that little ‘tookie’ – brilliant invention! Love your writing too, always so fun and engaging to read. These are very similar to the apple pockest i make :) I love your images! I eyed the pictures for a long time before caving to the temptation, and I should’ve done it sooner! They are divine. And for the other readers interested, I had good luck adding Kraft caramels (underneath the apple slices), and also freezing them and baking. Thank you so very much for this recipe! I really wish I would have seen this before I started trying to make “healthy” food decisions. Looks like I’m just going to have to find a special occasion which would allow these as a splurge! Thanks for sharing these beautiful treats! I can’t wait to try out the recipe. This is ridiculously adorable! I can eat 10 of them right now….mmmmm drooling…. i made these last week. SO good!!! i gobbled them up really quickly. I made these today while avoiding writing an appellate brief. They not only managed to occupy my hands and mind for over an hour, they were wonderful. My husband came walking up the stairs from the basement with a mouthful and very matter-of-factly stated: “those are amazing. I could eat every one right now.” Shortly, after this statement, he did. (Secretly, I managed to freeze a baker’s dozen for a later date, maybe I’ll pull those out some day I “mess up” as a peace offering). The crust recipe is wonderful – and you’re so right, COLD is key! Thanks for the recipe. You are right. Extreme Cuteness : ). Doing with a cooking class, young teens, so preparing some of the work beforehand! Yumola heaven! (Did I just make up a word? Yes I believe I did. That’s what these baby pie cookies will do to you!!). They are splendid- the perfect balance of cuteness factor and deliciousness is found in this recipe. This likely would not be something I would make more than 1x per year as they are a lot of fuss, but they ARE worth it. I made a half-recipe (12 cookies) and wish I had done the whole thing. I baked 4 of them for my boyfriend and I last night and froze 8 for a small dinner gathering on Halloween…(he told me to screw the guests and go ahead and bake the rest of them for us…I contemplated momentarily, but I do want to show off and think these are the perfect little dessert to get oohs and ahhhs from the guests). Deb: One question/mistake I may have made: I froze the rest WITH the egg and sugar on top- I noticed after that it was recommended to freeze without the egg/sugar topping- any particular reason? I know you hear it all the time, but THANK YOU for your innovative ideas, delicious recipes, and down-to-earth/funny commentaries. Made these last night for a Halloween party, and they were a big hit. Must admit I cheated with the pie dough: a friend owns a bakery here in Seattle that makes superb all-butter, ‘u-bake’ crusts, so I used her product. In an attempt to gild the lily, I added a daub of salted caramel sauce for caramel apple in honor of the holiday. Sooooo tasty– thanks for the fun recipe! I made these yesterday after apple picking this weekend. Ahh, so cute!! Brought them into work to share. Awesome recommendation! Thanks. I made these last week and they were AMAZING. Everyone loved them. Perfect size for a treat that will feed a lot more people than one pie and for portion control. I had a few kids help out and they loved it. The cookies weren’t as pretty as in the images, but they had so much fun. WOW!! I remember my Grandma making Apple Pie almost every week.I use to cook with her in the kitchen.I plan on whipping up a batch for my hubby. I made these for a Halloween party this weekend and they were a hit! It was actually my first time making pie dough, so I appreciated that you made me promise not to mess around with warm, soft dough. Normally I’m very impatient and try to power through, but your stern warning reminded me to keep cooling the dough. I found it easier to assemble, cut, and crimp the cookies, then put them on the baking sheet in the fridge as I finished each one, then egg-wash-and-sugar the whole batch in one go right before baking. Although my six little teacups lined up on the counter were mighty cute! Thanks for this recipe, and indeed for all of them. My binder of printed-from-the-internet recipes in the kitchen is about 75% Smitten Kitchen at this point. No complaints! Those look so amazing! My husband would love them! Oh wow. These are the best things I have EVER baked. So very delicious, can’t get over the consistency of the crust! These were great. Thank you, once again, for sharing something magically delicious with your audience. These are so adorable. Thank you for sharing! Dorie Greenspan did something just like these on her website a few weeks ago. I wonder whose is more delicious. They both look wonderful. Y-U-M! I made these as open-faced tarts for my daughter’s 5th grade Halloween party (the teacher is reading them the kids’ version of The Omnivore’s Dilemma so that tells you about this year’s snacks!) and they were a hit. Just a circle of dough with a slice of apple baked on top; I found it easier to do in HUGE volume. Made these last weekend and … WOW! I mean they are just perfect! You are amazing. I went slow with the assembling first couple but got the process down pact and they were done in no time! We topped them with some toasted almond gelato – DELISH! Thanks for an amazing recipe. So cute too! Made these yesterday and they were a massive hit. I think your website has been single-handedly responsible for convincing me that I can bake. Took the cookies to work and my boss described them as “life-changing”. Thanks!!! Oh man Deb! These are great I did have a problem with mine sealing but it may be that I put to much filling in them. The crust recipie is wonderful! My fiancé and i enjoyed them they were gone in two days! These are the ideal dessert to pull from your freezer when you need something impromptu. I had frozen about a dozen the week before relatives dropped in and they were quite impressed when I was able to whip up this dessert in only the time it required to bake them. The rich apple pie scent that filled my house was an extra bonus! I have never posted, but always enjoyed EVERY recipe I have made of yours. These…brought tears of joy to my eyes before I promptly ate the entire batch (I made 1/3 of the recipe). Simply amazing. Also, I live at 5,000 feet and didn’t have to make any adjustments for any other high-altitude dwellers! I love them, I’m a baker at a pie pantry in Michigan and these little bites are going to be a hit when I make, bake and bring them in to the other bakers. What a lovely recipe! The last of them just came out of the oven. I did use a 2 inch round for the apples (to optimize apple usage) and about a 2.75 inch for the crust rounds and the edges held pretty well, I did enjoy the ‘candy’ that ozzed out quite a bit. I yielded 24 cookies + a bit of crust for a small tart. Also added approximately a heaping teaspoon of flour to the sugar mixture to tighten it up. Defiantly making these for my less-than-desert-excited family for the holiday. I made these and they were AMAZING!!!! The first batch didn’t make it out of the kitchen and my family and I just polished off the second batch. I don’t know if I’m ever making traditional apple pie again. I had some leftover dough and the apple centers left, so I chopped up the extra apple, mixed it with the spice and made some little apple popovers. I started following your blog a couple a months ago and I absolutely love it! I actually had an apple pie question for you. Thanksgiving is such a crazy time and I’d love to prepare some items ahead of time. I am making an apple pie this year and was wondering if the apples would spoil if I made the pie 2 nights ahead of time. Should I go ahead and bake the pie 2 days ahead and then warm it up the day we are serving? Or should I make the pie and then freeze it, and bake it the day we are serving. Thanks in advance for the advice! The apples shouldn’t spoil. A bigger risk is that the crust will get soggy as they leak their juices. Might be best to make the crust, make the filling, and roll and assemble it when you need it. Both can be kept in the fridge. You’ll need extra lemon juice so the apples don’t brown too much. O, brave new world, that has such cookies in’t! My 11-year-old son and I have made these twice! Today he invited a friend over to make them with us, which was a blast. We have cheated in a major way by using store-made puff pastry – we wouldn’t have ever done it if we’d started with making the crust :-( and I know they would be even more amazing with homemade crust. We make them big – I don’t have round cutters, so we used a nearly-3-inch ramekin as the cutter for the crust, and we put a couple of apple slices in to up the fruit:crust ratio. We also drastically increased the amount of cinnamon. So far we’ve had rave reviews from everyone who’s tried them, and my boy is very pleased with himself. He’s especially proud of his idea to saute the leftover apples in cinnamon sugar and butter, and eat them hot (almost straight from the pan, but I convinced him to use a bowl to cool them a little). He ate them too fast for me to get a taste, but they smelled good. Crust to filling ratio is off the charts, I like that! Lol I wouldn’t mind changing the way making apple pies to have more crust. Your tip on dough softening and then transferring into the freezer is a great tip! gotta try that one. Wow–these are great! I so enjoyed watching my son going into a state of bliss while he was eating one of these!! The crust was the best pie crust I’ve ever made. I’m definitely doing these for Thanksgiving! Thank you Thank you for all your wonderful recipes. Here in Austria, there is no website which is as great as yours! I always get it right the first time (said by an 18 year old college student with no real cooking experience). So thank you! PS: The cookies are ready in 7 min and they already look very delicious! Adorable! Made these last night and they turned out wonderfully. I will now plan a tea party around these. The last time I made a pie crust, it was a recipe from a book, took me six hours, and turned out HORRIBLE. It was dense, tough, tasteless and ugly. I used your recipe and techniques this time. Now I feel like a pie crust genius. And it only took twenty minutes for the crust to come together. Also, I’m pretty sure these cookies will get me a husband. I made this the week they came out, and they were awesome. My mom suggested a pumpkin pie variation, so I’m going to try that for thanksgiving next week! These are fantastic! After I made them a few days ago I found that I had quite a bit of the sugar sprinkle mix leftover. I have been stirring it into my porridge every morning since. Yum yum. So cute, perfect for holiday parties! I can’t wait to try these. I don’t like apple pie because of the texture, but I think I will really like these!! These turned out perfectly, and man are they are delicious. Too bad they are all eaten. I love your site, just discovered it yesterday and went straight to work on these. Thanks! How genius is this. I surely will try that though winter is full on in Canada. They’re delicious! But, I’m exhausted. Um, obviously I’m very late, but can I say, “I love You” I don’t like pie only pie crust so this seems so awesome and if I wasn’t baking: YOUR chocolate doughnut holes, my go to cupcakes, and Gingerbread cake bites, I would make these TONIGHT. If I freeze the cookies leaving out the egg wash and sprinkled sugar, when I go to bake them should I then brush them with egg and sprinkle with sugar, or should I skip that step entirely? I’d brush/sprinkle the cookies right before baking them. Oh. My. Goodness. I made these s few nights ago – the most HEAVENLY things I’ve ever made! Thank you for the amazing recipe!!! Oh. Wow. These just came out of the oven and I’ve burned my fingers in my desperate attempt to get them into my mouth as quickly as possible. Your crust recipe has never failed me, and to have such an intense crust:filling ratio is absolutely heavenly. I did look at the recipe initially and think, “What! Are you crazy? That’s way too much work!” But the more I thought about them, the more I wanted them, and I’m so glad you shared the recipe! I just finished baking a batch of these. I’ve already eaten half of the first pan. I will definitely be making these for an upcoming cookie exchange! They are picture perfect, unique, and so delicious! They did leak a little in the oven, but only some of the apple juices. I’ll just have to crimp better next time around. 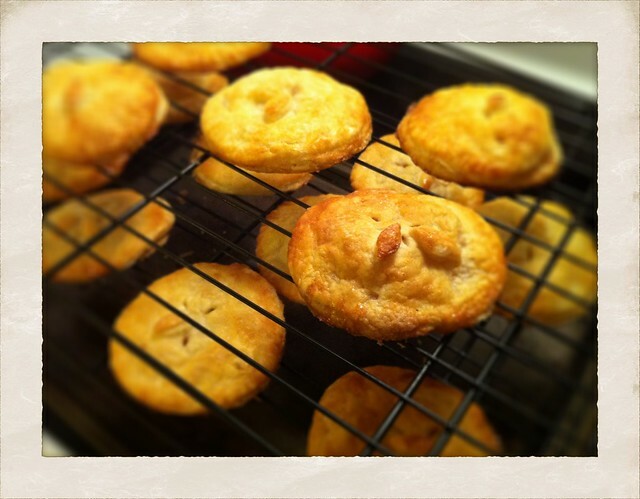 I made these with a friend as both of our first venture into making pie dough from scratch… and your recipe and instructions were great! We were so pleased with the results! Thanks for a wonderful and unique idea! Hi Deb! I made this recipe and I LOVED it! I did change a couple of things though. I wanted to make these a little more like cookies and less like pie crust so I added eggs, vanilla and more sugar to the dough. I posted it on my blog today, so I hope you have a chance to take a look at the recipe. Thanks for the inspiration! OMG! I made these and they are soooooooooooooo good. I can’t believe how flaky they came out! I saved a few discs to try it with sweet potato filling and I’m seriously contemplating frying them. I’m so sad though, I told some friends i would share/save them some, but um…I don’t know if that’s going to happen. BRILLIANT! I would feel guilty making a whole pan of pie-crust scrap cookies without baking a pie, too, but this way i can pretend i’m baking a fruit pie and still get my fill of pastry. Made ’em with some strawberries that had been languishing in the freezer–not seasonally appropriate, but no way i’m keeping those strawberries til spring. Hi Christina — I am using a parchment paper-lined baking sheet. Parchment paper is nonstick to a high temperature; wax paper will melt at a low temperature and is not intended for baking. I don’t care for silicone baking sheets or mats. I find that baked goods don’t get as crisp or brown on/in them. These are amazing! Have made them at least 5 times and am now baking a HUGE batch for a cookie swap! Sounds like a lot of work, but really not! This is officially the first recipe I have attempted after reading and printing them and then not following through! Highly recommend them. So worth the time! Took these to a holiday party & they were a big hit, of course. I had never baked pie before but the crust still turned out amazing. They are a lot of work for only a few cookies but definitely worth it. Thanks Deb – I always turn to you for potlucks! Okay, I HAVE to make these. My grandmother would adore them. I’ve never made pie crust before and she’s a master of pies…so if I make these and she loves them, I will feel like the Best Baker Ever. And she totally deserves these delicious-looking cutie cookies! I made this just last week using (prepare yourself for the travesty) ready made dough. I was running low on time. They still turned out wonderfully. Everyone around my house and at my boyfriend’s job really enjoyed them. Thanks for the awesome recipe! Made these this afternoon for a cookie swap tonight, but I made a few extras to sample before the party — they are unbelievably good! The dough came out awesome and the filling is just enough. Thanks for another great recipe! I made these and they were actually not too difficult to make; rather they were totally fun to make setting up an assembly line and everything! These are purely awesome and dangerously delicious. Everyone at the holiday party loved them and they were gone within minutes. Showing up fashionably late served those guests no good; they missed out on the mini pie cookies! Thank you — yet again — for a wonderful recipe, Deb. I did it!! I made them, and they came out so cute! My very first pie crust, and I’m still shocked it turned out as nice as it did. One question, though – where did you get your handy little pastry blender? Because I used forks from the freezer and it took foreeeeever. Would peaches work as well for this recipe? I’d like to have a variety of flavors. Let me know! I will be making these cookies for the 4th time since Thanksgiving tomorrow. At Thanksgiving, my sister held the tray of cookies in the kitchen for only “special” people, aka those in the kitchen when I brought them in (2 out of 18 people for dinner!). Needless to say, they were a huge hit! I ran out of time at Christmas so they will be my New Years cookies – can you think of a better way to bring the New Year in? Thank you so much for this recipe….working on the 44 clove soup now, love the smell in the kitchen….this has been a great site to find and I have shared with a friend who also signed up. Keep it up! I intended on making these…but my 2 year old daughter went through our apples before I managed to make them. She sneaks apples, and then asks if she can have them once there is a teeny tiny bite already taken out of it. Of course you can dear. So I made a blueberry filling for them instead, and they turned out adorable! Obviously they were a bit more oozy, but they look and taste great. I saw these when you first posted them in October and vowed to make them one day. Last night, I did. They came out amazingly even though I realized I didn’t roll out the dough nearly thin enough and I didn’t have differing sizes of circular cookie cutters. So instead I used a big flower shaped one a big star shaped one and I actually had one that was shaped like an apple (that one was too cute) and all of them held their shapes nicely through the edge pressing and cooking. The only thing I think I would do differently next time (other than the obvious roll the dough thinner) is also slice the apples thinner and try to stuff more of them inside the cookie to also help with the crust/apple ratio. These were such a huge hit, and not hard work I dares say! I do have one question, though: When I put my cookies in the oven, some of the butter of the pastry melted into a pool around the cookies. Some of it was re-absorbed, and only a little bit remained around them. Any idea why this happened? Ellina — That often means that the pieces of butter are too big. Thanks! Seems like I overdid it trying not to overwork the dough!! i am making these as i type this and they are so cute and not hard to make. just time consuming,not that thats bad when you have an entire afternoon with not a thing to do!! can’t wait to taste! JUST MADE THESE AND I love them. But because I like my apple pies VERY apple-y. Instead of using a “disc” of apple, I diced them and stuffed the pies. Darn you. I already had a full day – deadlines and everything – and was hastily looking for something to bake for the guy who mows our lawn, when I came across these. The good news is, they were delicious. These are perfect for Pi day tomorrow, lmao. I made them without even realizing the day. WHATEVER. I couldn’t resist trying out this recipe. At first I believed to have made the pastry dough incorrectly (instead of crumbly pea sized butter and flour, it turned somewhat creamy, result of me not chilling the butter thoroughly! >.<) but I went ahead with the baking anyways. I realize now that the less water you mix into this dough, the flakier it will turn out (from making other butter doughs previously). The dry dough was some what difficult to roll, but it was worth it when it came out of the oven (and into my stomach). After making a batch with one slice of 1/8 inch apple, I decided to heap them in for a more obvious apple taste. They were so ridiculously cute and when my mother asked me how many the batch made, I had to confess that I had eaten a bunch before starting to count. Wonderful share, I look forward to creating more of these lovely recipes. I hope they taste as good as they sound&look! These look so amazing! I’m a college student, and would love to make them here for a class, but sort of don’t have the necessary tools to make pie dough from scratch or to roll it out. Do you think they would work with the pillsbury pie dough from the grocery store? OMG… Only if my Dad was still living! My niece made these and brought them to a family gathering, and I couldn’t stop eating them. Growing up in New Enagland, my fathers all time favorite was anything made with a pie crust. If he’d had the opportunity to have these pie cookies, he been a devoted fan forever. Thanks so much for sharing this recipe and reminding me to of my beloved Dad. Oh WOW! I can’t wait for fall all of a sudden. Perhaps July 4th will have to suffice! I have to give you a website suggestion though, you should have a format for printing option. I want to print this recipe out, with pictures perhaps, but right now it wants to print the ENTIRE webpage… comments and all. Just a suggestion! I can’t want to try these out. Nevermind, I found it. Ok, maybe just make it a little easier to find? I have nothing new to add except to say that I just tried making these and they were fabulous! My rolling skills are on the weak side but they still turned out perfectly. Thank you! Thank you for this unique idea! I have made the apple pie cookies a few times and each time they came out adorable and delicious. Hi Amanda, I haven’t tried with blueberries but since they are extra juicy, I would make a blueberry compote and thicken it with some cornstarch. Also, I’ve frozen my pies and found that when they bake up (usually takes longer in the oven), the crust is firmer and holds it shape better. So for me, I would try to thicken the filling and bake them frozen. I wonder if it’s also a question of over filling (which I also tend to do)? LMK how it goes. Gosh, these were tasty. Much easier to make than I expected and looked great once baked. Just tried these for the first time today– amazing! I made one batch as above, and got so excited that I made a second one with apple slices soaked in bourbon for half an hour. Thank you lots and lots for this one, I’m ready for autumn again! I know this is way late, but is it possible to replace the butter with vegetable oil? I want to make these dairy free but don’t want to compromise the texture of the crust. Downside: the butter leached out. Upside: it kind of fried the bottoms (my sweetheart: “Don’t hate me, but you just made McDonald’s apple pie with better ingredients.”) A winner of a recipe, though. I diced the apples, sprinkled the heaps with the spiced sugar, and forgot to dock the tops (maybe also why they leached liquid). Lots of room to play with the concept. Thanks, Deb — this is going to be one of those “hope there’s some left tomorrow” SK recipes. Made these tonight! Only took about 3 hours for 2 batches… However, they’re amazing. Definitely best for crust lovers. I gotta tell you I love this crust recipe so much that I have adapted it into different stuff, all basically apples and crust. First was individual apples gallettes. Easier when your feeling lazy. Tonight I made pie-lettes using a tart pan, because my crazy husband says he prefers more apple than crust. I had a lot of left over crust dough, so I used a tiny circle cookie cutter to make a bunch of crust cookies which I plan to use with pudding, yogurt, jam, etc. thanks for this recipe! These are awesome! I have been following your site for years and we have made lots of your recipes. Some time during the last week my wife said she had seen this recipe and she wanted to try it out. Of course I agreed so she made them today. I have never had a tastier crust in my life. These little apple pie cookies are amazing! Searching for dinner ideas, found this, lost 30 mins reading, still looking for dinner ideas. Have dessert idea. There seems to be a problem with this recipe, I think it’s mislabelled. The title says “apple pie cookies” but I appear to have created ambrosia. I cheated and used the Pillsbury pie crusts. The finished product may not be as delicious as the original but the whole process took less than an hour (I only made a dozen)! They’re in the oven!! I can’t wait to try them, such a great cookie idea :) What about peaches? Could you please post on how to make the filling for other fruits? Thanks, I love your website! These are now my go-to cookies. They are a tiny bit labor-intensive, but absolutely worth it! I have to make a double batch, because I cannot keep them on the plate as they come out of the oven. I made them with slices of fresh cherries last month – and they were amazing. Other than changing the fruit every once in a while, I follow the recipe exactly and they are perfectly flaky, yummy goodness! Wow what a great recipe. Both my husband and I absolutely loved them. Sweet, but not too sweet, light, flaky pastry and great flavour. I halved the recipe and now wish I hadn’t!! Won’t be making that mistake again LOL! Thanks for sharing. This was my second time making this recipe, and it’s seriously one of the best for sharing. In honour of pi day today (3/14) I made these cookies for work and everyone asked for the recipe. I used honeycrisp apples and squeezed lemon on all the slices before dipping in the sugar/spice mix. A lot of them oozed apple-goodness during baking, which I was a little worried about (maybe my dough wasn’t cold enough?) but after cooling on a wire rack they held together just fine. I would seriously recommend this recipe, it’s phenomenal. Like everyone says, these are labor intensive, but well worth it! The first batch I made I followed to the letter. Came out perfect. I wasn’t crazy about was how empty the cookie was inside though with only a slight hint of apple. The fruit seemed to have all but melted away during the baking process. I’d love to see more of the apple and actually feel the texture as I bite into it. So for the second batch, I added chopped raisins and 2 slices of apple. Had to go to a bigger diameter cookie cutter and the cookies came out a little lumpy looking (vs. the slim looking “cookie” from the first batch). Not sure if it was worth it. The apples still melted down. Gosh. Dare I try 3 slices of apple? I guess at that point I should just make a pie. Anyways, the recipe is still tasty and we gobbled every last cookie up in about 4 hours. Seriously. Made these for the second time tonight. Definitely went smoother than my first try. They are cooling now I made them for a friends surprise birthday party-I’m sure they will be a hit! And just think at Easter I couldn’t make pie dough correctly. Okay! So last night my four year old and I were trying to pick our favorite dessert. I said, “Pie, ice cream, and cookies…and wouldn’t it be great if we could have all three at once? ?” She agreed. And, LA!!! Here it is. Has anyone turned these into ice cream sandwiches yet??? I tried these tonight, and they turned out great. I was surprised that the crust was so perfectly flaky. Next time, I will use more apples though! I was so focused on the apple slices being the right shape for the cookies, but more apples will make it even better. Otherwise, really yummy! Thanks for this recipe! I made these yesterday and they are absolutely wonderful! I made these today, and I know this is an odd thing to complain about, but I ran into so few problems I felt like I must be doing something wrong! But then when I tasted them, all doubt faded away. You just make even complicated recipes seem accessible! Thanks for another great one! AWESOME! We tried them with nutella also. YUM!!!!!!!!!!! The nutella oozes out of the crust when you’re eating it. Whoa I just made these and they are seriously delicious!!!!!!! Although I’m not a very experienced baker and the recipe intimidated me a bit at first, they turned out beautifully!! If anybody has had Finnish prune tarts, these remind me of them based on the crust/filling ratio. I guess I better warn you: these took me over three hours to make so make sure you have a few hours to spare and lots of energy!! But it was very much worth it because they look beautiful (I’d be proud to serve them to guests) but they also taste phenomenal! Hello, I don’t know if this has been answered before, but am I able to use store bought shortcrust pastry? I know it kind of defeats the purpose of this seemingly wonderful recipe (I mean n disrespect) but I have an abundance of it sitting in my freezer and I’ve run out of ideas as to what to use it on. I don’t see why you couldn’t use storebought instead. If it is indeed shortcrust, it might be slightly more buttery and cookie-like. Oh my goodness! I just finished making these and felt the need to post immediately that they are DELICIOUS! Amazing recipe, thank you for sharing!!! My 13yo daughter and I made these on Monday. So easy and more importantly, delicious. Thank You. Hi – These tasted really great but the pastry puffed up and some of the seams opened up, leaving the filling to ooze out. I was careful to seal and crimp the edges. Perhaps there was also an issue with the type of apple I used as the filling was runny. I am a v experienced home baker but I can’t figure out what wrong. Grateful for your thoughts. I’ve just assembled my pies and they’re in the freezer awaiting baking. I’ve got lots of apple bits left over- did you do anything with the scraps? I’m thinking a nice apple loaf would be good, but I haven’t found a recipe that would work with the weirdly shaped apple slices I’ve got. I’ve baked extra apple filling before (here, mix in any extra cinnamon-sugar) in a baking dish in the oven until soft. The cooled compote is excellent in yogurt or the like. You could also chop them up a bit more and use them in these muffins. Okay these were DELICIOUS. I did use puff pastry because no way was I making pie dough, and it was perfect with the filling. Also, 2 sheets of pepperidge farm puff pastry yielded me only 18 cookies total, so there’s that to keep in mind, but once you make a batch and realize how easy it is, it’s not impossible to contemplate making another. I also put 2 apple slices in each cookie, but I think my cookies were larger than Deb’s. And they were in the oven closer to 45 minutes than 25; I just kept checking on them every 5 minutes. I loved these though, and the people at the dinner I brought them to RAVED. Will definitely be making these again (with puff pastry though, ha!). Thanks for sharing the recipe! Oh, also re: extra apples/filling – I had loads of extra half circles of apple and a pile of extra cinnamon and sugar so I just tossed it all together, melted some butter in a pan, and threw them in with flour and oats sprinkled on (didn’t even measure). Stirred for five minutes; it was like apple crumble! SO GOOD. these are now a staple at church bake sales. i also made some for work today to rave reviews. for those who want to streamline a bit & have more filling taste, i chop the apples fairly small and mix with the cinnamon, nutmeg, and sugar. 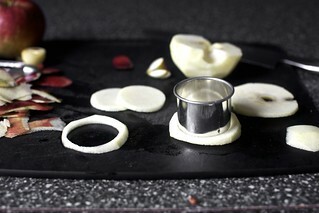 this saves a bowl and biscuit/cookie cutter, as well as makes the apple taste come through more than slices. also, i’ve found that heating the cookies for 10-15 seconds turns the cookies into mini warm apple pies. a bit of heaven on earth. thanks so much, deb, for making me look like the world’s best baker with this recipe. happy halloween. Have made these a few times with excellent results (the only reason I would attempt something that called for six dishes just to assemble is because of some not so small article of faith that what you’ve written will and always does work). At this point, I’ve been using a 3″ cutter for a slightly larger cookie, and cutting the apple into smaller chunks to increase the cinnamon/sugar mixture ratio to apple, though it means a slightly taller “cookie” than shown. Sadly, pretty much like everyone else who has commented after making them, they just don’t last very long. In reading through something nearing 600 comments, I’ve only seen one (somewhere in the 300s I think) where the commenter mentioned extending the concept to some other kind of “pie”. Blueberry, and from what I read, due to the juiciness of it, required chilling it all further (I think they may have frozen them), to reduce leakage. Very tricky. But no one’s mentioned anything (ok, so I may have missed a few comments in the 400s), about attempting something like this with say, pecans, coconut and perhaps something like a caramel candy, somehow approximating the taste of a pecan pie cookie? I’m curious since I recognize that the cookies’ filling has to be pretty solid in order not to leak out before the baking is done. I made these and they tasted great.My dough was so crumbly that I couldn’t get it to roll thinly enough without ripping. I made about 12 pies with that amount of dough and although delicious, I’d prefer a thinner crust. Should I have added more water to the dough or gotten the butter even smaller? Any suggestions? You are so smart. These are so clever. Last night I assembled these and put them in the freezer. This morning I baked them and took them to work. I wanted them to be really, really fresh. They were outstanding. Winter is pie season. I’ll be making these again. Thank you so much. ive been making these delicious yummy yum Yums for years. Yes the process is annoying, but it is definitely worth it. This is also my go to pie dough recipe!! Made these today in a coconut cream variation using a different pie filling recipe. They are still just as awesome. Hi there, quick question. I have some home-made salted caramel sauce, do you think I could add a tsp on top of the apples? I have made these a few times and they are delicious and the pastry is sooo light. Andrea — Yes, just seal it well. Thanks Deb for the prompt reply. Once again the recipe didn’t fail me and they were delicious. Also served them with some sauce on the side, they went down a storm!! Deb — though this is my first post, I have been a HUGE fan for years! Your recipes never disappoint, and I’m looking forward to trying this one! 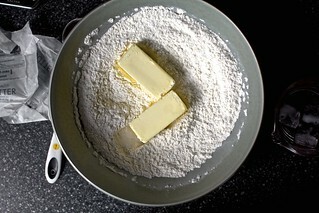 What type of pastry blender do you recommend so that I can throw the whole stick of butter in (like you mention above)? Pre-cutting butter is my least favorite baking task!! Thank you! Marisa — I’ve been using the OXO one for many years and have been happy with it. The blades are more like knives and less like wires, so they’re not prone to bending against the cold butter. I’ve been making these for the last four years, ever since I found this recipe. Every time I make them, they disappear before they even have time to cool. They also work well if you put a tiny circle of caramel on top of the apple! Thanks for a truly incredible recipe! Just made these yesterday. I streamlined in a similar way as a few other commenters: chopped up the apples very small, then mixed them in a bowl with some fresh lemon juice, sugar, and pumpkin pie spice. Way less fussy to fill that way, plus you get more apples per bite. I used two different sized wine glasses to cut the circles (no cookie cutters to be found), and the sizing worked out well. I think I overworked the dough a bit but the results were still wonderful! They definitely turned out more like tiny pies than cookies, though (and mine certainly were not as pretty as the pics above) – but were a huge hit. This was my first-ever pie dough, and I was seriously intimidated, given that I cannot even successfully work with the packaged/frozen stuff. I halved the recipe – won’t be making that mistake again. While mine don’t look anywhere as pretty as yours Deb, they’re so incredibly delicious I cannot believe they came out of my kitchen! Unlike many other commenters, though, I feel slicing the apples actually caused them to work really well, because the apple seemed to retain some shape/texture rather than turn to mush. I eyeballed my butter usage and may have overdone it a little – these are almost too buttery, if there is such a thing – but the dough was surprisingly easy. I did struggle a little with the rolling out but that was only due to it being a ridiculously warm day in a ridiculously warm country (India). Kept putting it back in the fridge/freezer to chill. I can’t say this wasn’t labour intensive, but it was So. Totally. Worth. It. Am curious, though: what makes these cookies rather than mini-pies? Because they totally felt like the latter to me, unless I got the texture (deliciously) wrong. Maybe one of the most time consuming things I’ve baked in a long time, but also one of the most amazing. I brought them to a backyard BBQ and the presentation was amazing and the taste even better. I sliced my apples 1/16 inch with a mandolin and my 3 year old daughter accidentally marinated them in a little lemon juice and the sugar spice mix and that actually made them even more delicious. I used a couple slices and just folded them up since i didn’t have cookie cutters (just used a glass to cut out the dough. How easy/hard do you think it would be to make this with blueberries instead of apples? How many cups of berries would be comparable to the amount of apples used, here? You could use blueberries; you won’t need a lot. The trickiest thing will be that at their size, you might have a hard time crimping the lids around a whole blueberry since they’re much taller than these thin slices of apple. They’re less likely to be cookie shaped. These were so good! I only had problems with getting my top and bottom to seal together. Probably didn’t brush enough flour off before trying… I did freeze my butter and then grate it to insure that it was super cold but still uniform in size and dispersed evenly. Worked really well. Pookies (pie+cookie) were very flaky. I love your blog so much. I havr so many of your recipes saved, but haven’t had time to try any of them. Next break I have you are taking priority on my “to bake” list. Finally made them. Sooo sooo good. I only had a sun shaped cookie cutter that was about the size I wanted, so I ended up with some delicious sun/flower pastries (I also only had a scalloped to cut the apples, so overall some funky looking pies). Thank you for the detailed instructions, made the assembly a breeze. Wound up with 17. I just took the first batch out of the oven. These are incredibly delicious! Thank you for a wonderful recipe! My question is, if I were to attempt to add cheese to make cheesy apple pie cookies should I just add cheese to the crust or should I play around with the amount of butter in the crust because of the oil in the cheese? Thanks!! These were AMAZING. I handled the dough a bit too much (hot southwestern kitchen) but they still turned out fantastically. Just the right ratios, I wouldn’t change a thing except one; cut two different sizes of discs of dough, one larger than the other. It makes it way easier to seal and you can just crimp around an edge, otherwise I found them a tiny bit leakier than I’d want. I made these last weekend and loved them! Not sure how to post a picture of them but they were super cute and delicious! i didn’t have small, round cookie cutters, so i used two sizes of biscuit cutters instead which meant my cookies were about twice as big as the originals, but i loved the larger size and would make them that way again. plus, it gave more room for a generous piece of apple. i also only peeled one apple before slicing and cutting and realized there was really no point of that step. since you’re cutting out rounds, skip the peeling and just slice! and lastly, i only got about one dozen from my batch of dough (since mine were so large) and i needed two dozen for the cookie party i was attending that night so i ran to the store and grabbed a refrigerated crust for the other dozen and they still turned out great. if short on time or patience, consider cheating a bit and using a store bought dough in a pinch. I’ve been making these gems every fall for a few years and I keep coming back! I’m currently plotting a big batch for this season and I’m thinking… while I LOVE a high crust ratio, an annoyingly large ratio of my loved ones wish there were more apples. I find myself defending the crusts #DEFENDTHECRUST and trying to convince them they’re wrong. This year, I’m wondering if i chop the apples up different in more of a mince, maybe the filling will seem more substantial without overloading each cookie with too many slices? Any thoughts welcome!! Again, I love these and have made them about 6 times so far, but in a rare moment of generosity I’m wondering how to appease the filling folk. A mince would be completely fine here, just keep it small so that you can keep it flat and easy to seal. I’m glad you’re enjoying them. you do not list how much salt to use? There’s 1 teaspoon table salt in the crust (fine sea salt works too). Love baked apple pies but always afraid to make one as I can never finish one completely! These are fantastic. A good early evening activity for me. Wrapped some for neighbors as Christmas goodies. Yummie and thank you. These look great I’m going to try to make these ahead of time and freeze .. I’m new to freezing things.. i can freeze them prior to baking them correct? And then bake them straight from the freezer? Thankyou! I love all all your recipes ! Looks delicious. I could go for it right now! I just made these with my eight year old son after work on a school night with frozen pie dough. Success! We just sliced some medium small apples and layered them on the dough and didn’t bother with making them a precise circumference. Of course they would have been prettier and the dough would have been better if we followed the recipe, but that’s what I love about Deb. When you’re working with a delicious foundation sticking to the details is not as relevant. Hello’ these sound amazing. What would you recommend if egg wash is not possible (food allergy). Is there an alternative or change in cooking, or just go without? I am thinking of making these now! Just made these apple pie “cookies”, they are delicious. I have a little problem with mine though. The pastry didn’t puff like yours in the pictures, I didn’t handle it very much, chilled it well. What do you think went wrong?